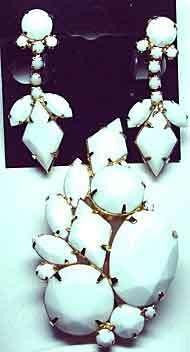 Sets, by our definition, are two matching pieces (earrings count as one piece);demi-parures have three matching pieces and full parures contain four or more matching pieces. 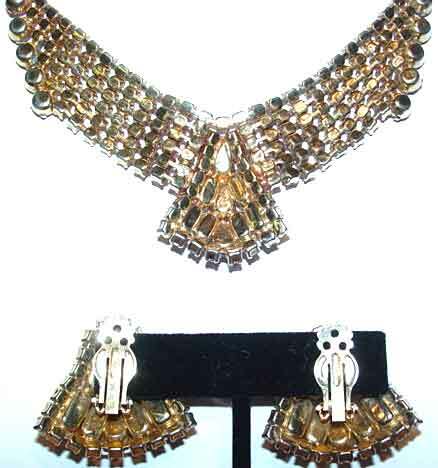 Sets may be necklace and earrings, bracelets and earrings, pins and earrings, necklace and bracelets, etc. All confirmed DeLizza and Elster (aka Juliana pieces), which are always unmarked, can be found on their own specific page. This page may contain unverified D&E. 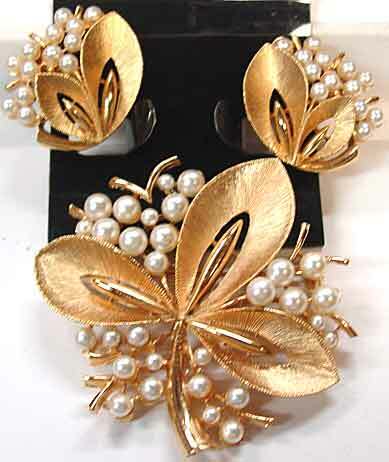 Description: Glass Pearl Brooch and Earrings Set - In the early 1960's, when women began hitting the work force en masse, tailored jewelry appropriate for the workplace was in demand, and many companies answered the call. Trifari was particularly well known for this genre during that time period, however, this is not Trifari, though it is similar in a general way. 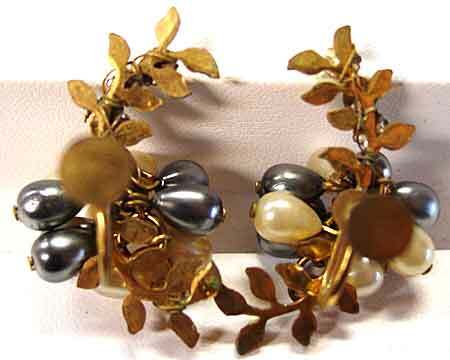 Creamy white glass pearls in different sizes are used generously on these pieces; the stirated goldtone finish on the leaves contrasts with the shiny goldtone parts. 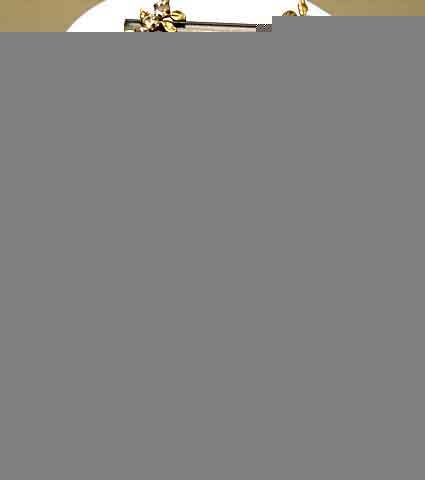 Excellent if not pristine condition, very nice quality and an exceptional bargain price. 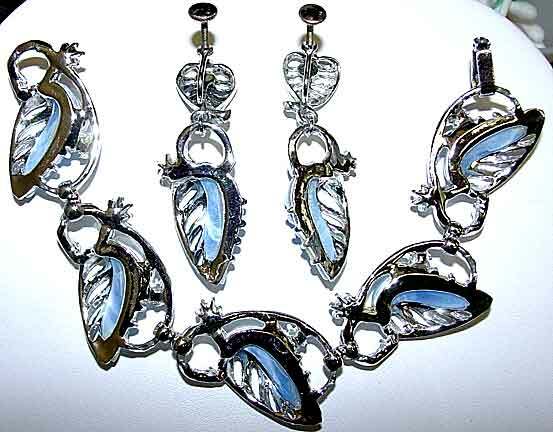 Description: Two-Tone Heart-Leaf Demi Parure - It's really a shame this set isn't signed. 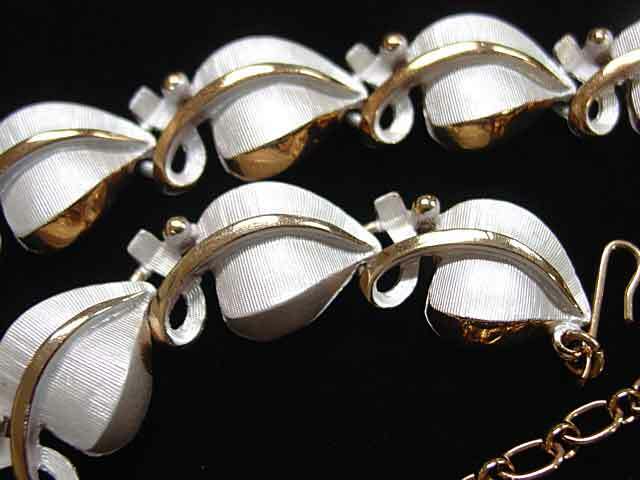 This is quite unusual, with a silvertone that is almost "white", contrasted with a goldtone that is almost a rosegold. 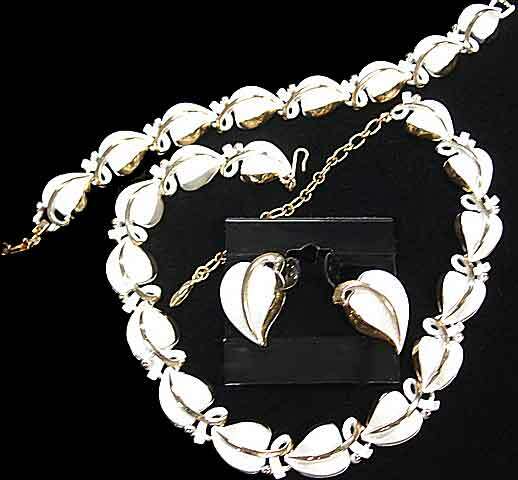 Heart shaped leaves make up the links, with an adjustable choker necklace that extends to a maximum of 16", the bracelet has a foldover clasp, 7 3/8". Both necklace and bracelet are about 1/2" wide. 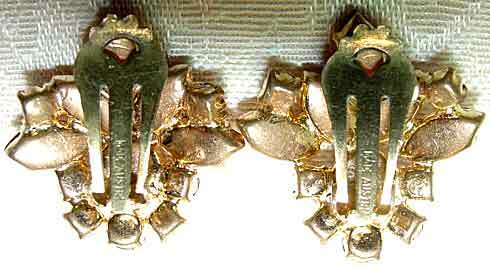 The earrings echo the same design, clip mechanisms, 1" x 3/4". Please refer to the closeups for the perfection of condition of these pieces. Quality set, exceptional price. 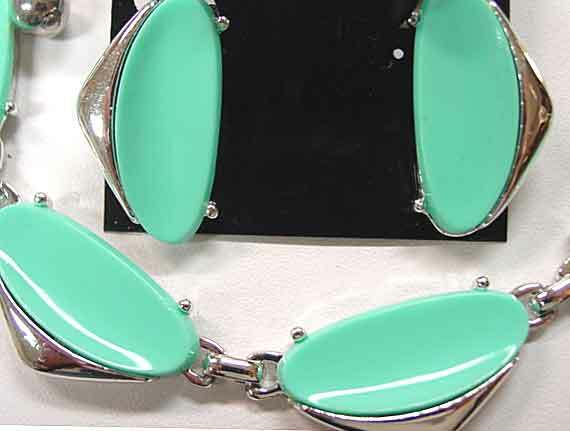 Description: Turquoise (Aqua) Thermoplastic Insert N-B-E Demi Parure - Fun, summer jewelry, probably from the late 1950-early 1960's when this shade of turquoise was popular in everything - clothing, cars, interior design. 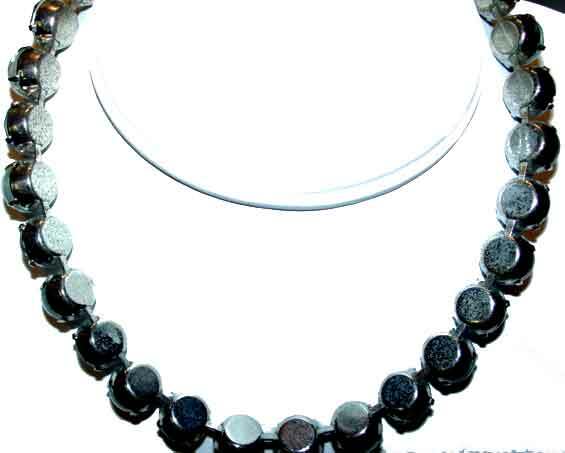 Adjustable choker extends to a maximum of 15 3/4"; bracelet is 7" x 1.25", clip earrings are 1 1/8" x 11/16". 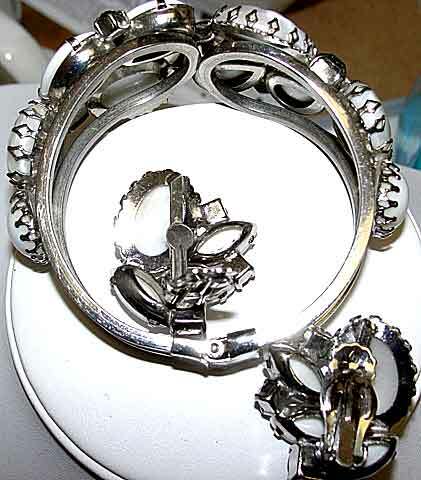 Silvertone setting, much better quality plating and more substantial weight than is usual for this type of set. Excellent if not pristine condition. Fab fun at a fab price. 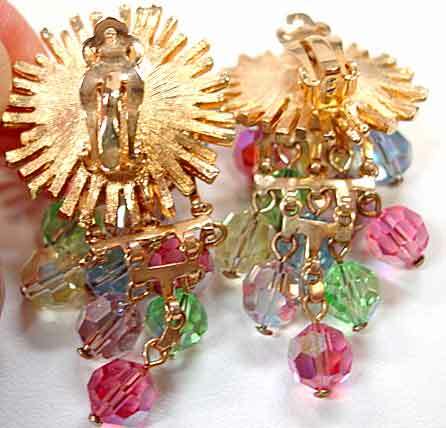 Description: Multi Pastel Crystal Cascade Necklace and Earrings Set - Rose pink, jonquil, lavender, peridot, and light blue (most of which are AB'd to some extent) crystal beads in a goldtone sunburst casting. 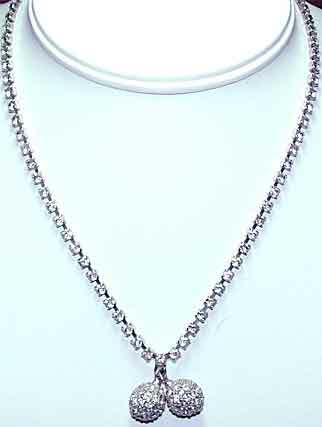 Pendant necklace chain is 24, a heavier open link chain with a foldover clasp and quality terminals. 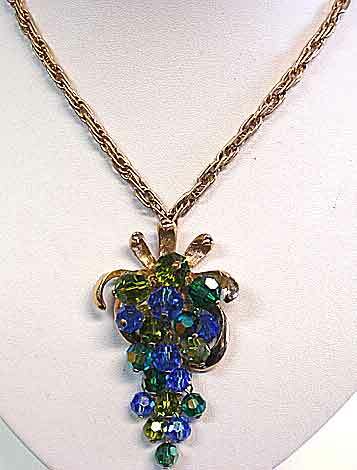 The cascade pendant is 2 1/2" by about 1 3/4". 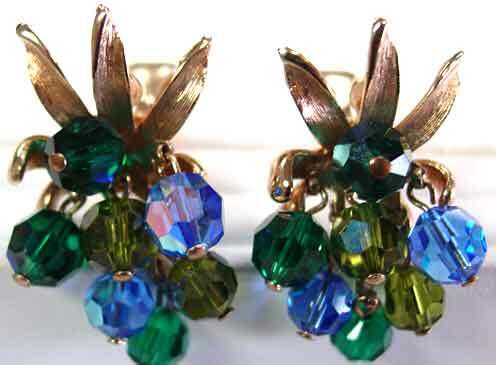 The clip earrings are 2" x 1", with a quality, patented clip mechanism. Excellent condition. Description: Pink, Green and White Crystal, Seedbead and Plastic Necklace and Earrings - While I don't normally offer this type of jewelry, this was just so pretty and in such good shape, I couldn't resist. 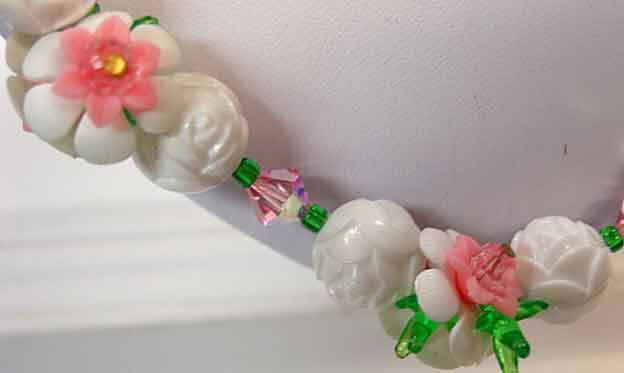 Floral motif design uses pink crystal as the centerpoint anchor for pink and white plastic component, green spiky pieces and white plastic floral bead stations that alternate with pink AB bicone crystal and emerald green seed beads. 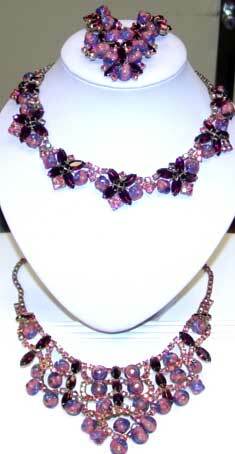 Necklace is 23" long; clip earrings are 1 1/4" x 1". Earrings use a slightly different configuration with four bicones and four seed beads encircling the bottom of the earrings. Lightweight but good quality. Fun, feminine confection. 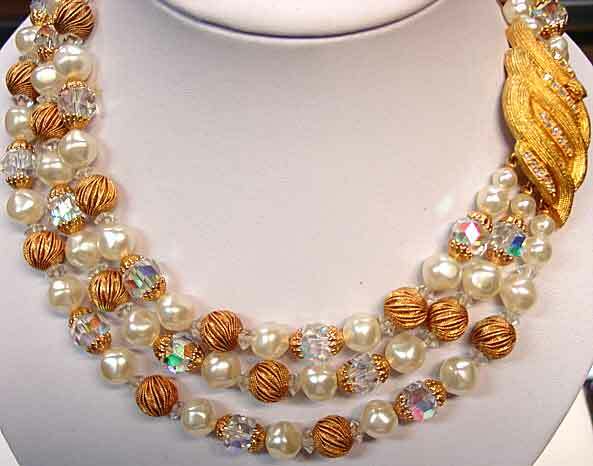 Description: Three Strand Glass Pearl/Crystal AB/ Goldtone Bead Necklace Bracelet Earrings Set - This impressive demi is chock full of quality components - softly faceted glass pearls, pleated goldtone twist beads, AB crystal rounds with heavy end caps, small clear bicones - plus clear AB rhinestone set clasps. Necklace is a nested style, shortest strand is 15" plus 1 3/4" for the fancy clasp (longest strand is about 19.5" plus clasp). Bracelet 7" including clasp, about 1 1/8" wide. 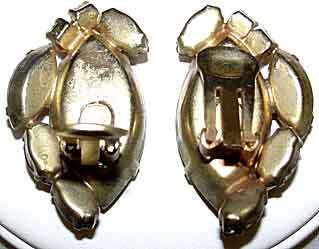 Clip earrings are domed, about 1 1/4" in diameter. Excellent condition, great 1960's set. 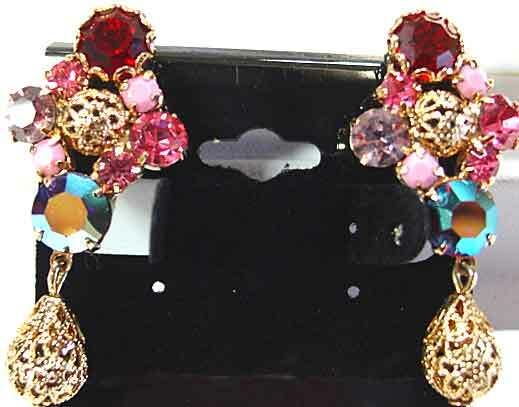 UE13-997 earrings (sold separately) came from the same seller and while they are not a match, would co-ordinate nicely. 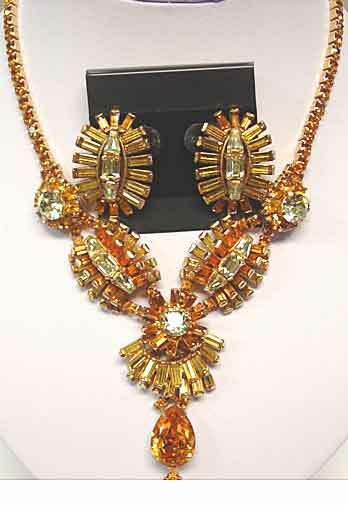 Description: Jonquil and Topaz Rhinestone Necklace and Earrings Set - A complex design in what I believe was originally a very expensive set, this uses jonquil baguettes, tapered baguettes, octagons and rounds and goldtone topaz rounds, baguettes and a single large pear. 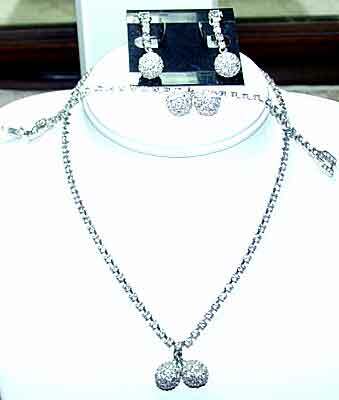 Push-in fancy rhinestone set clasp with a safety chain (almost unheard of on necklaces). 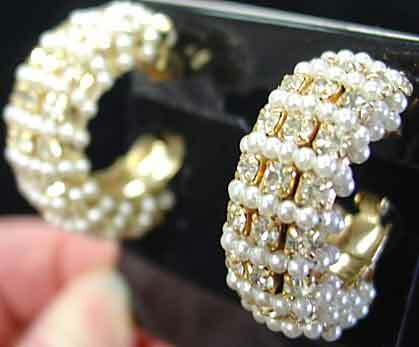 Earrings have do-nut hole clips, and are 1 1/4" x 7/8". Necklace is 16", 2 1/4" center drop. My monitor makes the colors look darker than they are in person, the yellow is lighter and the topaz is not orangey. Condition is excellent but it appears that the necklace pendant drop may have been pulled off and re-soldered on, the repair looks solid, and it also looks like someone may have decided to stabilize the top and bottom baguettes on the earrings with extra solder as well. I took huge closeups and I think you can see the work done. 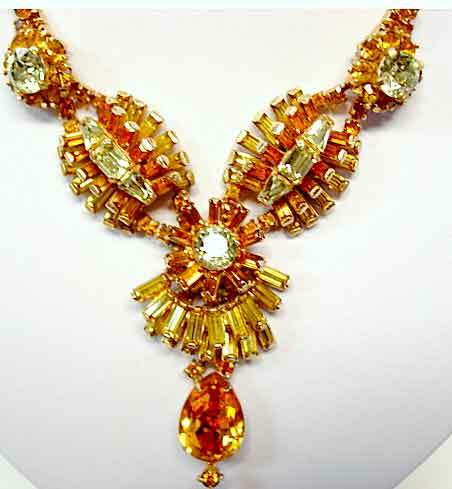 The necklace is very showy and flattering. Wonderful set with repairs as noted, done before I obtained the set. 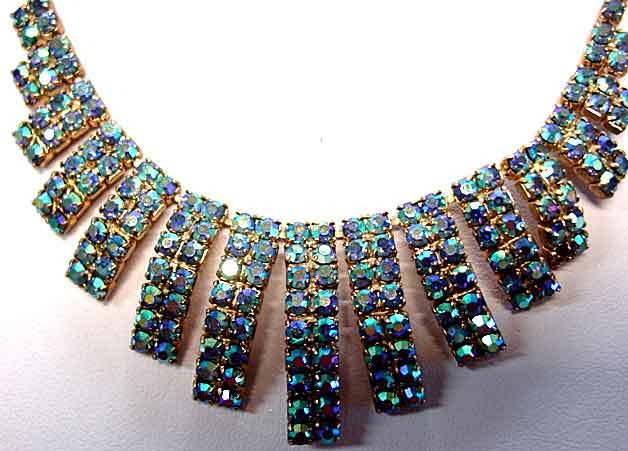 Description: Turquoise Aurora Borealis Rhinestone Necklace and Earrings Set - Colored aurora borealis stones were all the rage of the late 1950's, here is a pretty party set with curved, soldered rhinestone chain rows. 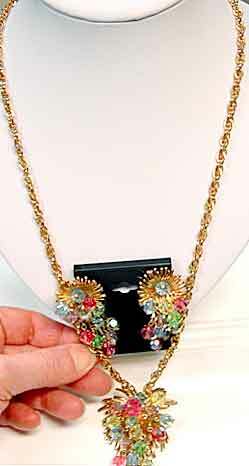 Clip earrings are 1" x 3/8", adjustable choker necklaces goes up to 16" and is 1 1/8" at widest point center front. 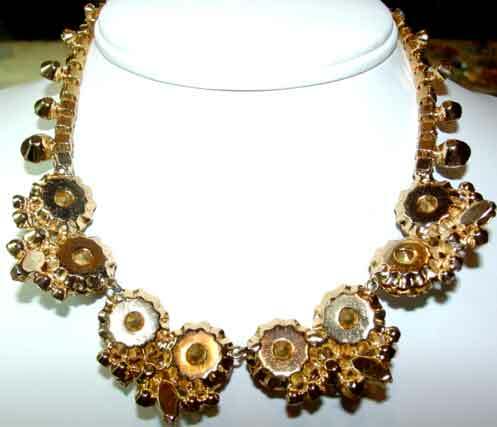 Muted goldtone setting, excellent condition. 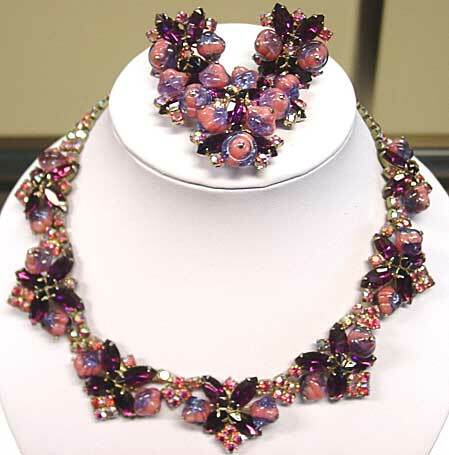 Description: Juliana Look Necklace and Earrings Set in Pink/Red/Lavender Stones - While this doesn't use the ear clip findings that one normally associates with DeLizza and Elster production, the style is certainly similar and extremely attractive. 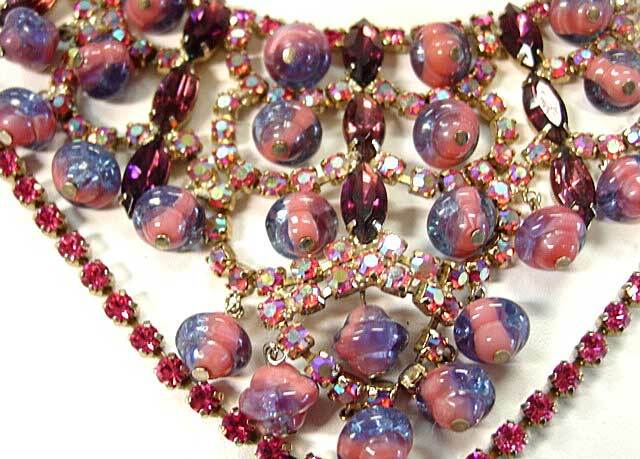 This uses pink, opaque pink, lavender, red, purple aurora borealis and clear rhinestones, as well as round and pear shaped goldtone filigree beads. 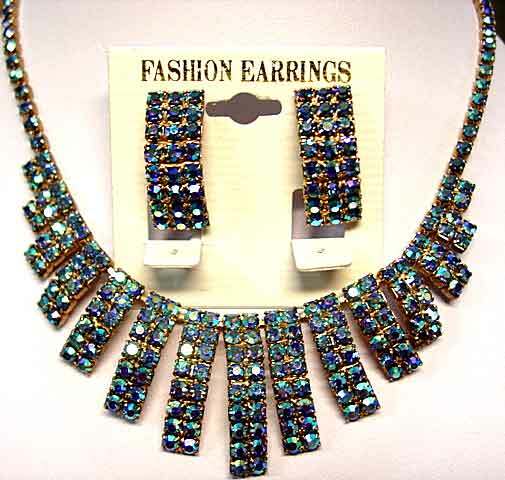 The earrings are 1 3/4" x 7/8", and the necklace is adjustable to 15 1/2", rhinestone set nice quality hook. Longer front dangles on necklace are about 1 1/2". Excellent condition, this needs to be seen in person to be appreciated. 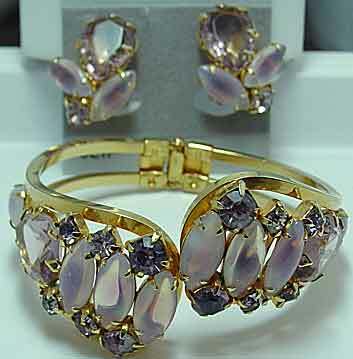 Description: Light Sapphire Blue Faux Moonstone and Rhinestone Bracelet and Earrings - This was sold to me as a set, upon close examination this is a marriage so I am selling the bracelet and throwing the earrings in as a "go with"; the oval moonstones on the earrings are larger than the bracelet, and the stones are chatons rather than dentelles; colorwise they do match in all respects. 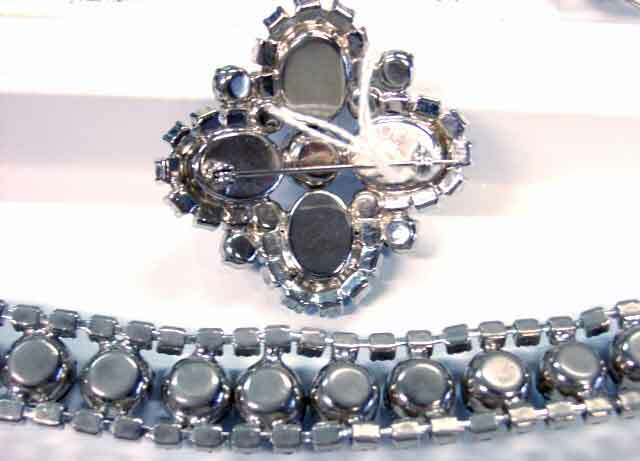 The bracelet uses 8mm dentelles alternating with the oval glass moonstone cabs; the borders are set with 6mm dentelles- 48 to be exact, plus a baguette set push in clasp and safety chain. About 7 1/2" x 7/8", silvertone setting. 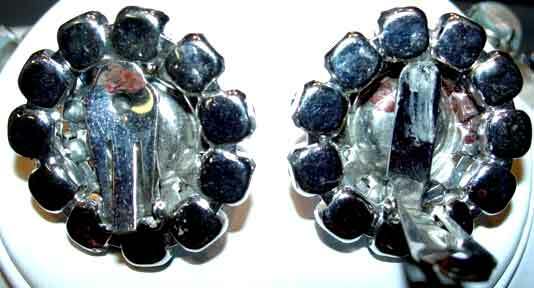 Earrings are clip, about 1 1/4" x 1". All excellent condition. 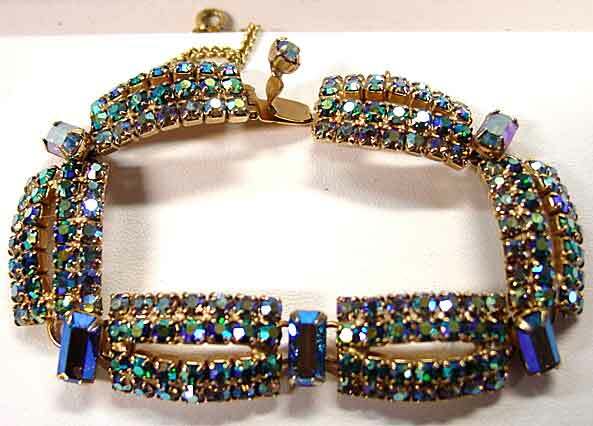 The blue rhinestones in the bracelet are particularly lovely. 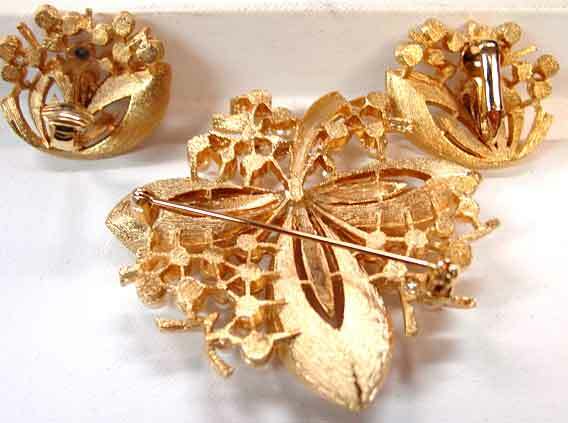 Description: Arum Rhinestone Brooch and Earrings Set - Gold metallic (arum) rhinestone pieces are not common; those that were produced circa 1960 were usually signed Weiss and manufactured by Hollycraft. 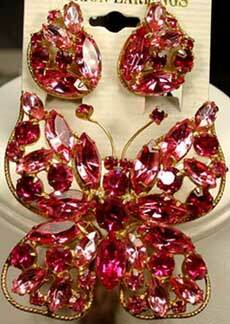 These were expensive specialty stones; there are literally hundreds of small arum rhinestones in this set. 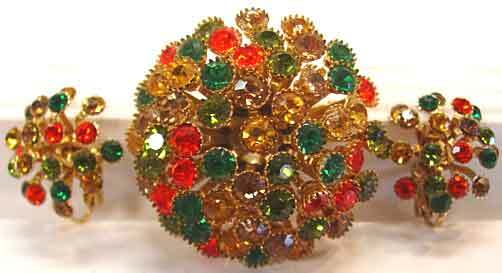 The brooch is almost a sunflower design, with a domed center, 2" in diameter. 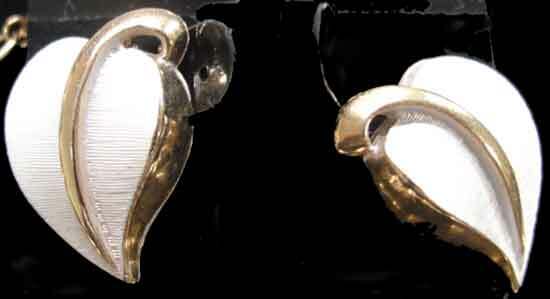 The clip "peacock" earrings are 2" x 3/4" at widest points. 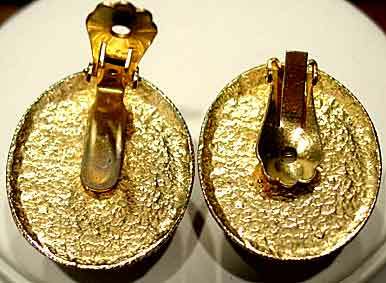 Excellent condition, these did not photograph particularly well, but have a subtle shimmer, like a goldtone version of marcasites. Bright goldtone setting. 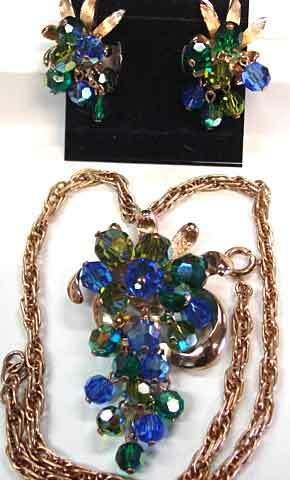 Description: Emerald, Olivine, Sapphire, and Colored AB Crystal Bead Waterfall Necklace and Earrings Set - 16" heavy goldtone chain with spring ring clasp and 2 3/4" waterfall pendant. 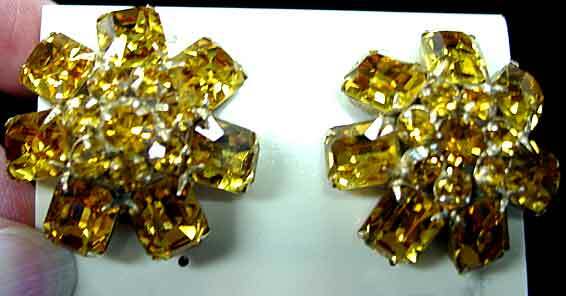 Matching clip earrings are 1 1/8" x 3/4". Excellent condition, wonderful color. 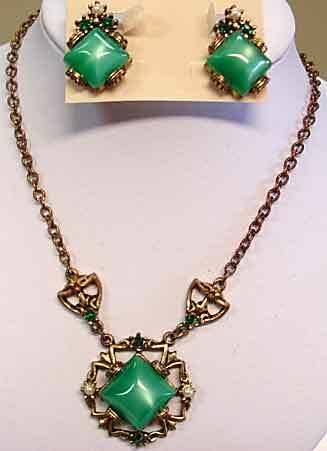 Description: Green Square Moonglow Necklace and Earrings Set - Unusual stones make this set out of the ordinary. 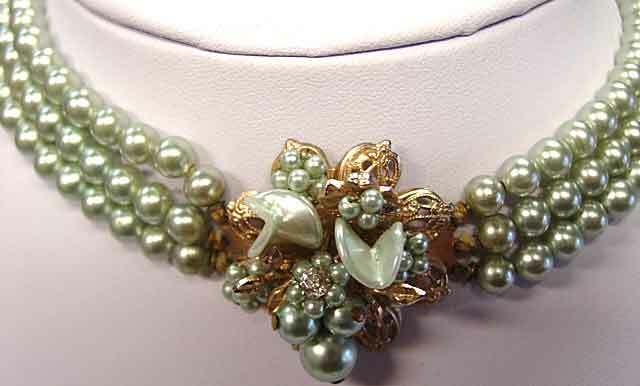 Set in goldtone, the necklace center is surrounded by green rhinestones and small glass pearls at N-S-E-W, and also on the accent side pieces. 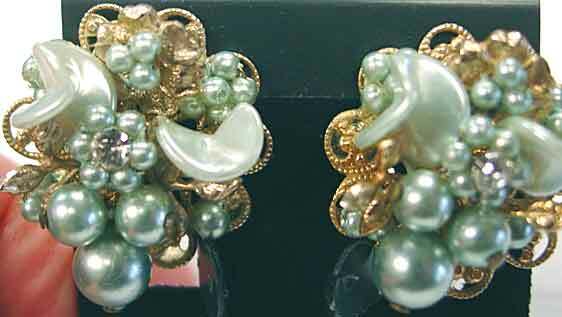 Clip earrings have two green rhinestones and a single glass pearl at the bottom of the slightly smaller green moonglow square used in the earrings. (earrings are pictured upside down, sorry). Necklace is adjustable to a maximum of 17"; earrings are 1 1/8" x 3/4". Chain has darkened with time, the pearl on one earring is somewhat scuffed, otherwise no issues. 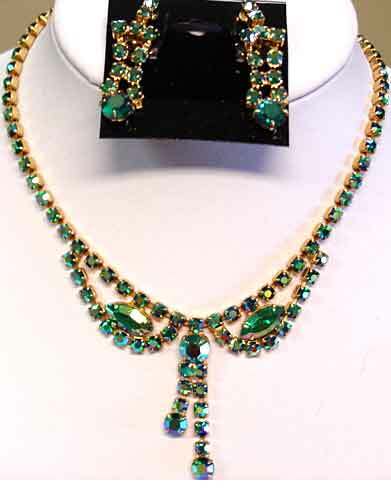 Description: Green Aurora Borealis Rhinestone Necklace and Earrings - Pretty and wearable set with all prong set stones, set in goldtone. Necklace adjust up to slightly over 15", center dangle is 1 3/4". 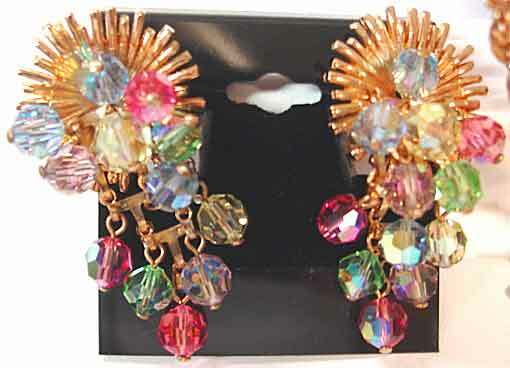 Clip earrings are dangle style, 1 5/8" x 1/2". This may be a marriage as there are no marquises in the earrrings, but if it is, it's a marriage made in heaven! No condition issues that I can see. 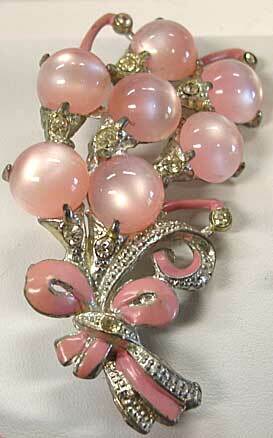 This would be wearable by any age group, and certainly not a color that you will find in contemporary prom jewelry. 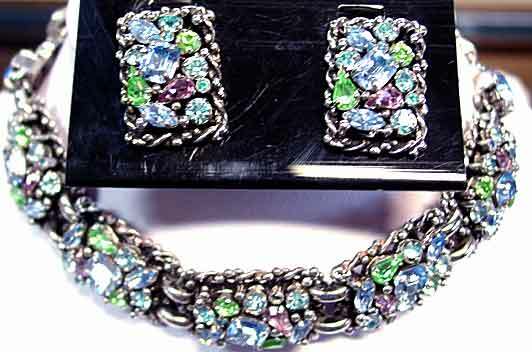 Description: Peking Glass Victorian Revival Bracelet and Earrings Set - Triple chain bracelet and matching clip earrings, set in brass that has darkened with time. 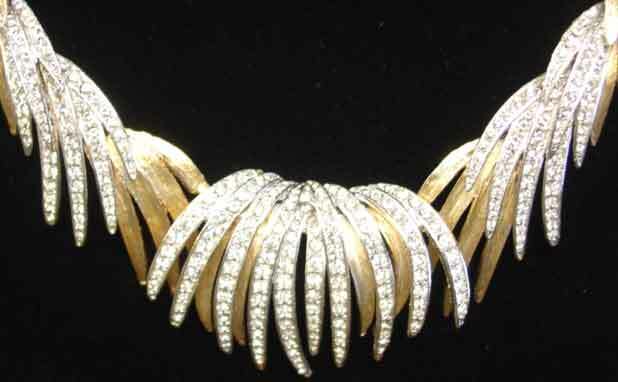 All pieces have a single dogtooth set Peking glass oval stone, surrounded by curving tendrils. Bracelet has a foldover clasp, slightly over 7", 1 1/4" at widest point. Earrings are about 1" in either direction. One tiny spot on one bracelet chain is a little darker than the rest, and a tiny spot of solder on back of the bracelet (see picture) that doesn't seem associated with any repair, otherwise no condition issues that I can see. Lovely and again, very wearable. Late 1930's. 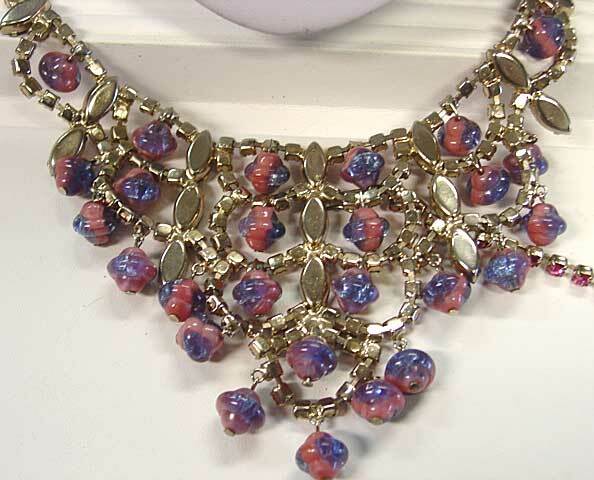 Description: Multi Pastel Rhinestone Choker/Dog Collar Necklace and Clip Earrings Set - Pretty set in antiqued silvertone. This looks to be Barclay and even uses the square connectors that Barclay often used, but no signature. 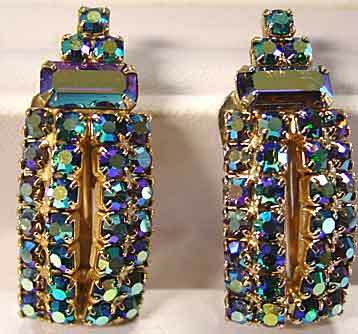 Rectangular links use light sapphire, peridot, lavender, faux alexandrite and aqua stones in various shapes and sizes, with small rounds in aqua and sapphire. 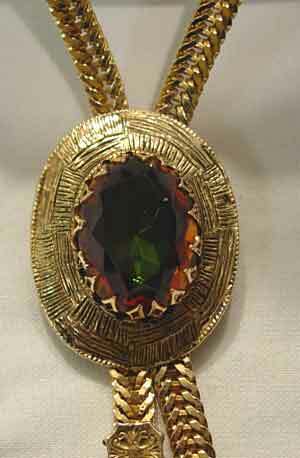 Center of necklace has five links, with each end finishing with a single large, prong set octagonal faux alexandrite. 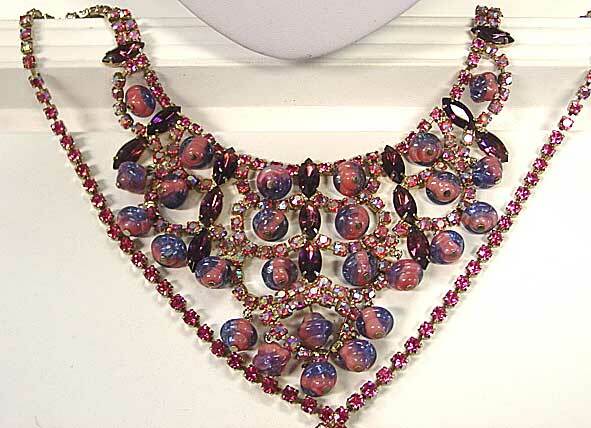 (The color change on these faux alexandrite stones is not dramatic but it is there.) 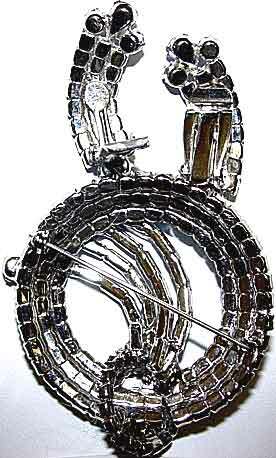 The ends finish with large square open links in silvertone. Hook clasp; chain on opposing end is probably an add-on for someone who didn't want to wear it as a dog collar OR just needed more neckroom. Extends to 15", could easily be added on to if desired. 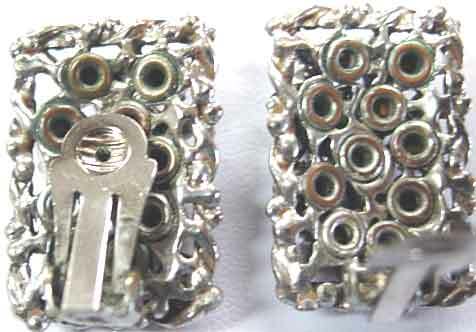 Clip earrings are 1 1/8" x 3/4". Plating is a little worn on backside connectors at contact points but it is very minor. Excellent condition. 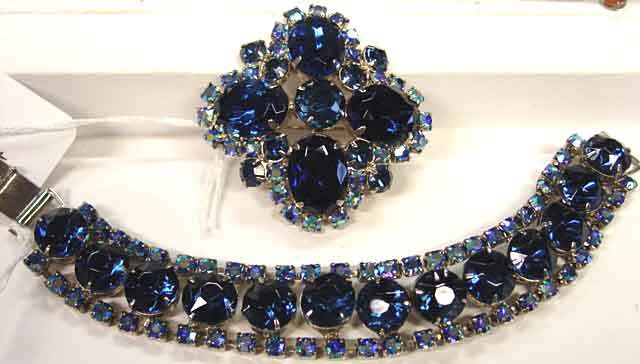 Description: Dark Blue/Blue AB Rhinestone Bracelet and Brooch Set - Both of these pieces use large fire-polished dentelles and blue aurora borealis rhinestone chain, with the brooch also using four large ovals, as well. 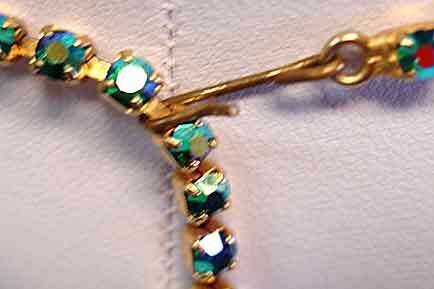 The pin stem on the brooch is set so that the brooch hangs as a "diamond" rather than a square. 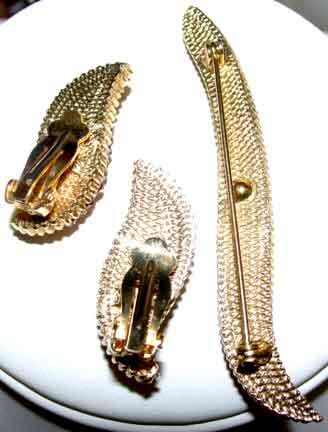 Bracelet has a wide foldover clasp and measures 7 1/8" x 3/4". Brooch is 2 1/4" x 2 1/4" and slightly domed. 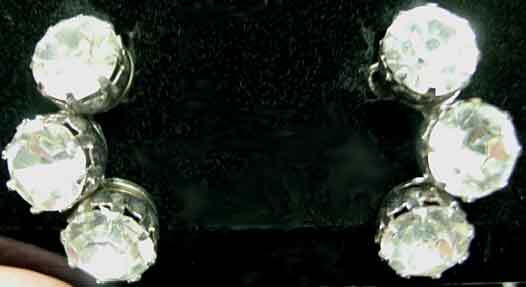 Silvertone setting, all stones are prong set. Excellent condition. 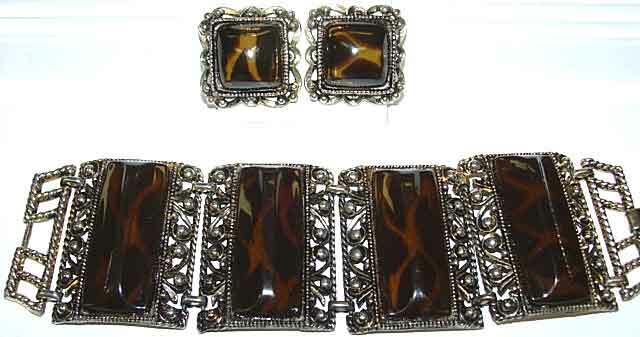 Description: Faux Tortoiseshell Bracelet and Earrings Set - If you're a person who loves wide, massive bracelets, this set is for you. Goldtone setting, much more gold in person, my flash kind of washed the color out. The bracelet is 2" wide, slightly less than 7 1/2" wearable length, foldover clasp. 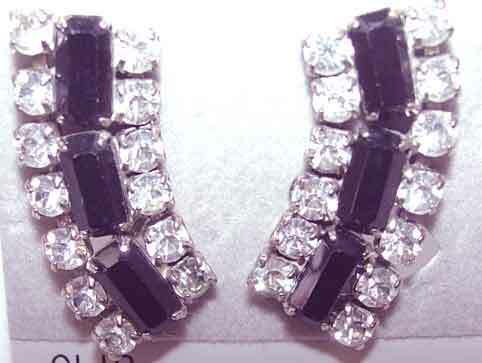 Clip earrings are 1 1/8" in both directions. Excellent condition with minimal plate wear on backside of bracelet. The bracing behind the bracelet links makes me think of Selro or Selini, but I think generally speaking that company made their bracelets a little longer, closer to 8". However I do not have enough experience with that brand to make a definitive call. Great set. 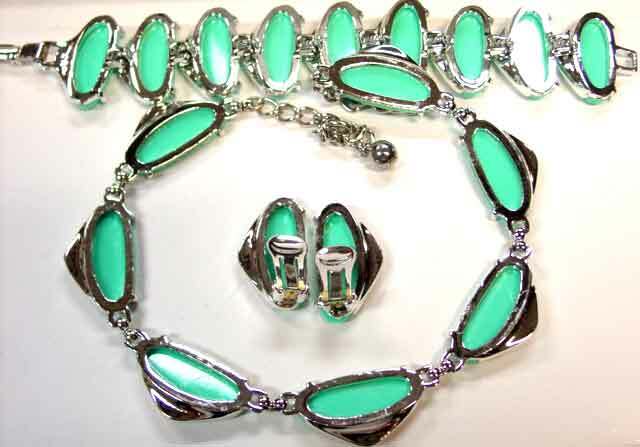 Description: Emerald/Peridot Green Aurora Borealis Rhinestone Bracelet and Earrings Set - While my pictures make these stones all look emerald green AB, the outer rows in certain lights look lighter, I am guessing they are peridot ABs. 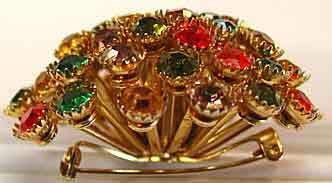 At any rate, these is a beautiful set, all stones are prong set, in goldtone. 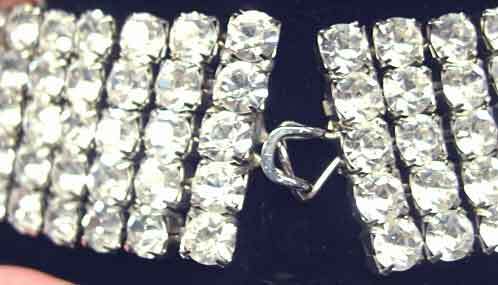 Bracelet has 6 links, joined by a baguette connector, and ending in a push in v clasp set with a single rhinestone; safety chain is intact and original. 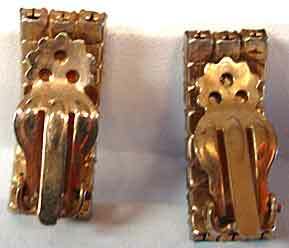 Clip earrings use the same motif as the link, with single baguette and three small rounds at the top. Bracelet is 7" x 9/16"; earrings are 1 3/8" x 9/16". Excellent condition, I see no issues here. 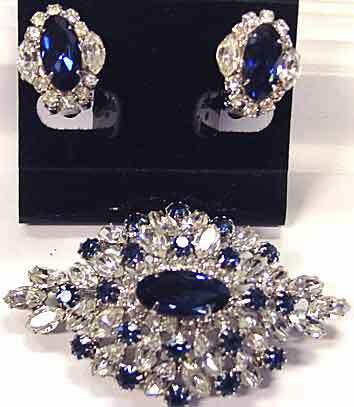 Description: Dark Blue and Clear rhinestone Brooch and Earrings Set - More of a fine jewelry look here, with each piece centered with an elongated oval in dark blue; brooch surrounded with clear rounds and marquises, and dark blue rounds. 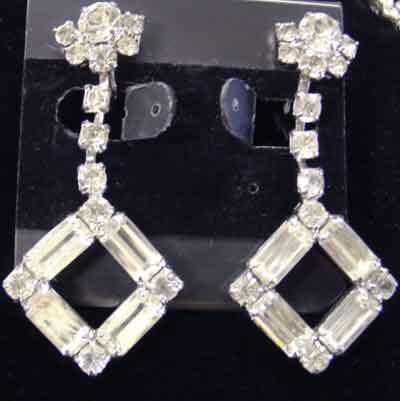 Clip earrings surround with clear rounds and marquises. 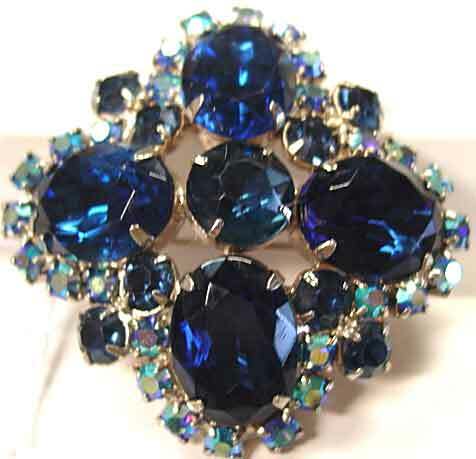 Rhodium plating, ovals are foiled but in open backed settings; all the stones are prong set, with the blue rounds multi prong set in the brooch. 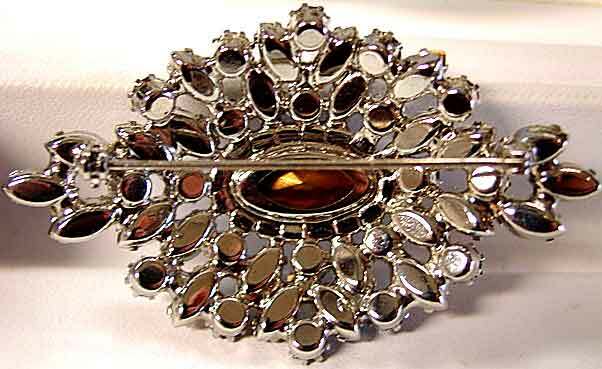 Brooch is 2 1/2" x 1 3/8" and slightly domed. Earrings are 3/4" x 5/8". Excellent condition. A harder to find color combination. 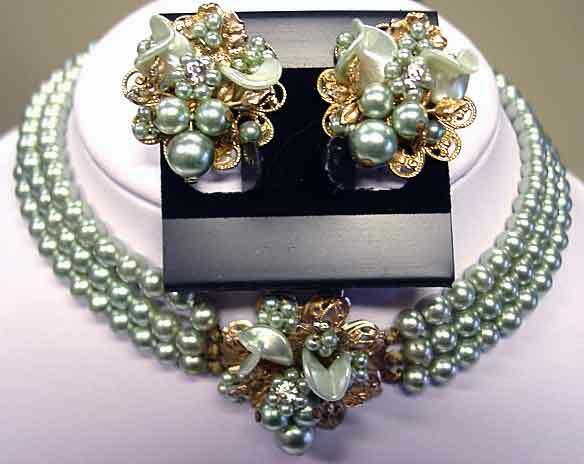 Description: Triple Strand Aqua Glass Pearl Dog Collar and Earrings Set - Adjustable dog collar style with three strands of aqua glass pearls on either side of a center medallion, which uses different sizes of aqua pearls, goldtone leaves, and dyed aqua shells and a single clear rhinestone. 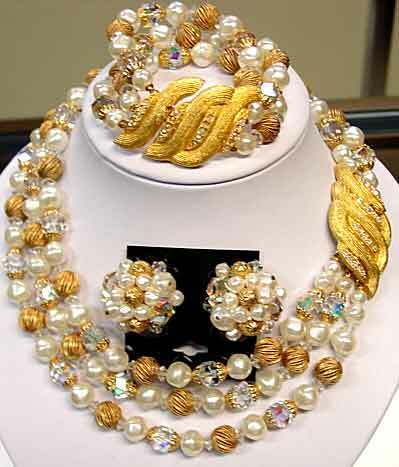 The larger pearls are held in place with head pins and the small pearls seem to be wired together, but all must be attached together at the center and glued to the goldtone filigree, as there is no sign of wiring on the back. 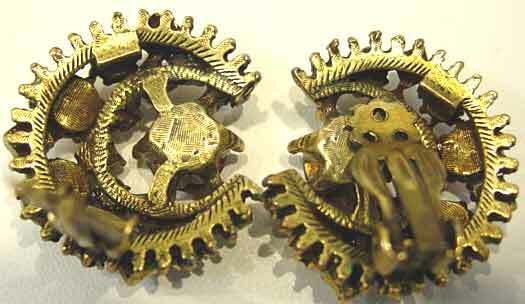 Screwback earrings follow an almost identical motif to center medallion, though the filigree base is slightly different and a tiny bit smaller, about 1" in diameter. 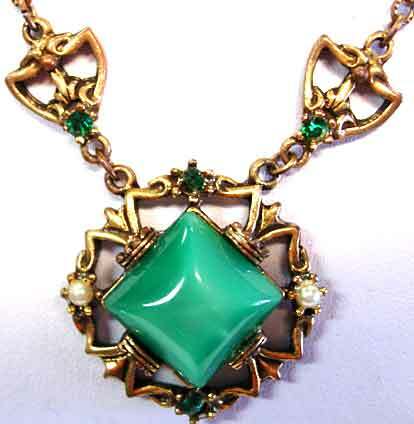 Necklace adjusts up to 14 1/2" and is 1 1/4" wide at center of medallion. 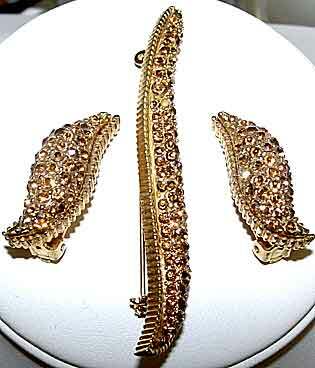 Excellent condition; I think the earrings could be converted to clip or pierced quite easily if desired. Pretty with a spring dress! 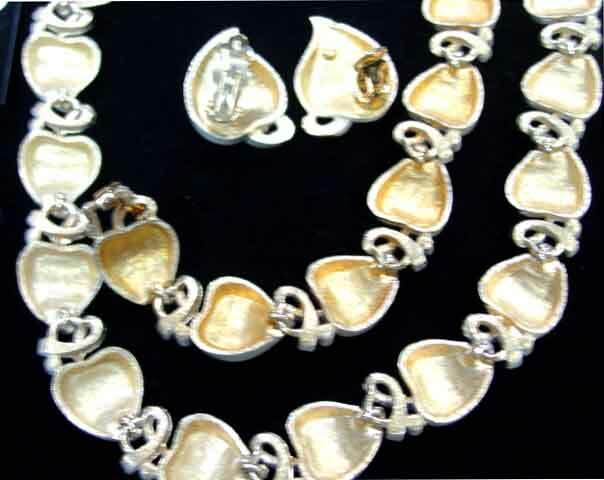 Description: Cream and Dark Grey Glass Pearl Necklace and Earrings Set - This is a little unusual in that the clasp is hidden behind the center motif of the necklace. 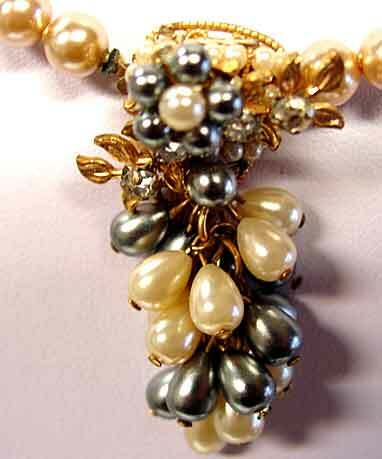 The clasp is decorated with grey and cream seed pearls, leaves with roses montees, and then a cascade of eggplant shaped cream and grey pearls. 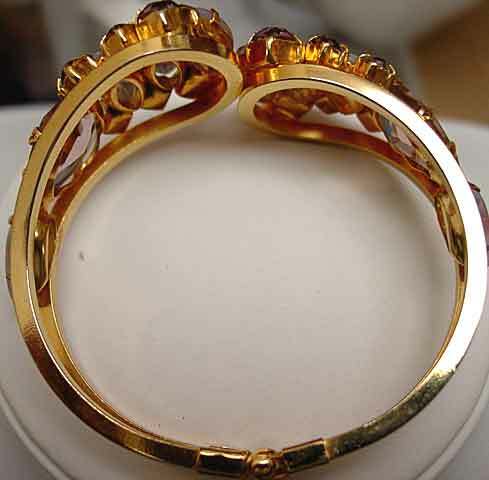 Goldtone setting. 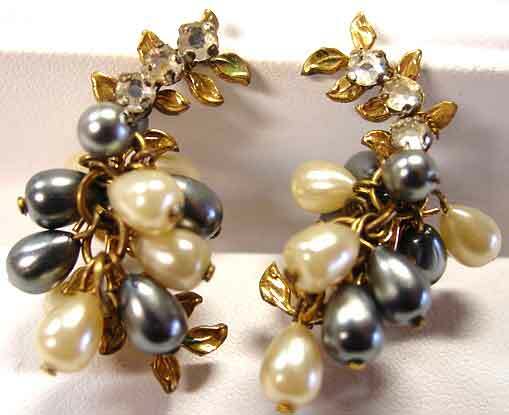 Screwback earrings use the same leaves, roses montees and eggplant shaped pearls of the necklace. Many of these components are wired on, lots of hand labor went into these pieces. Necklace is choker length, about 14 1/4", pearls are 6.5 mm, center drops 1 1/2". Earrings are 1 1/4" x 3/4" at widest point. Excellent condition, I see no flaws. 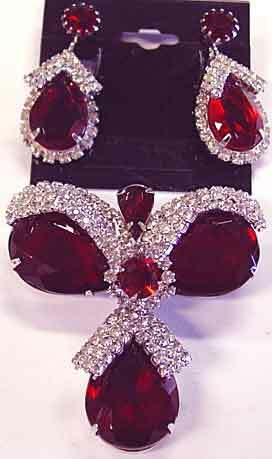 Description: Red and Clear Rhinestone Pin Pendant and Dangle Earrings Set - This looks like it would have been perfect for Julia Roberts to wear to the opera in "Pretty Woman", just in case Richard Gere forgot to pick up the real McCoy at Harry Winstons....Large red glass pears are accented with rows of clear rhinestones, everthing in prong set, and set in shiny silvertone (probably rhodium) plate. 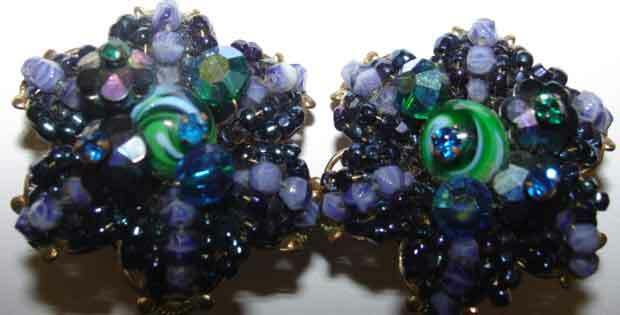 Earrings are clip, 1 1/2" x 3/4" at widest point. 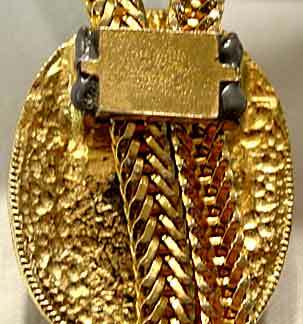 Pin pendant has free swinging pear stone, 2" x 2". Excellent condition. I have taken both a flash and non-flash shot, I would consider this to be dark siam (fire engine red). Looks very Kramer of NY but no signature. Description: Amazing Nautilus Bead Demi with Two Necklaces - Bib, Choker, Earrings and Brooch - What a mix of a pink and blue-purple nautilus beads, purple navettes, and rose and rose AB rhinestones. First, the bib - 29" adjustable inch of chain, 3" at center point. 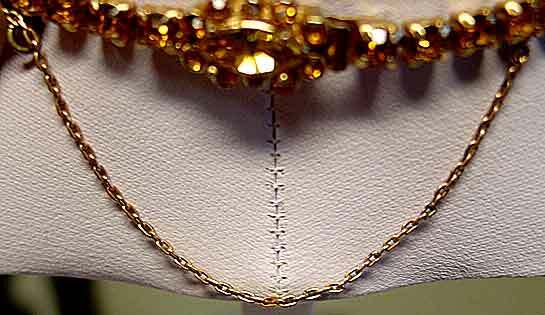 Chain portion goes from rose AB to rose rhinestones, and does NOT appear to be an add on. Choker is 17", also adjustable, and has a nautilus bead at the end of the hangchain. 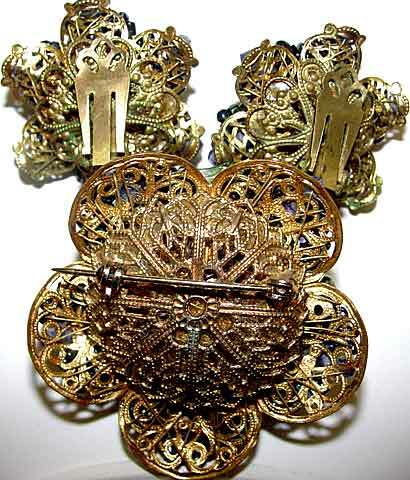 Brooch is 2" x 2", kind of shield shaped, clip earrings are 1" both ways. All set in a muted goldtone. Excellent vintage condition, I see no problems with any of these pieces. Notice the interesting construction technique. I don't believe these to be D&E as the early clips are not ones that I know of them using, however stylistically it is very similar. Dazzling! 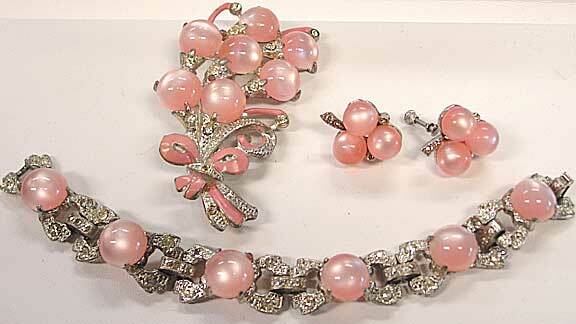 Description: Light Pink Moonglow and Rhinestone Brooch, Bracelet and Earrings Set - Again, most probably Coro, but unsigned. 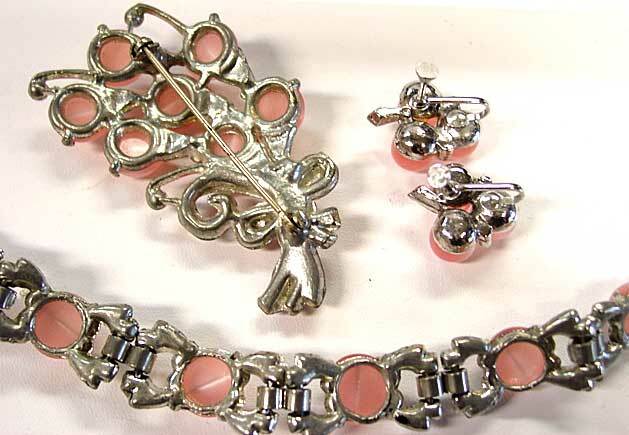 Brooch has pink enameling that the other pieces do not have, 3" x 1 1/2", bracelet is 6 3/4 with rhinestone set foldover clasp, earrings are screwback, about 3/4" in diameter. Silvertone potmetal. Excellent vintage condition. These are probably late 1930's. 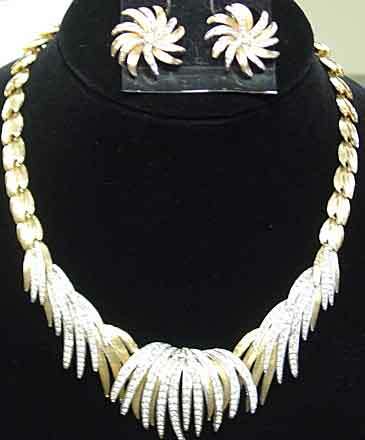 Description: Goldtone and Rhinestone Necklace and Earrings Set - Trailing rhinestone set leaves cascade over the top of goldtone leaves in this elegant necklace (rhinestones are in a silvertone setting). 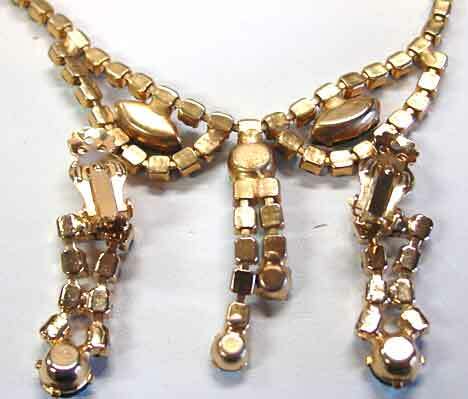 Central motif is made up of 9 linked graduated sections, with smaller goldtone links going around the rest of the piece and ending in a foldover clasp flanked by two smaller rhinestone set lines. 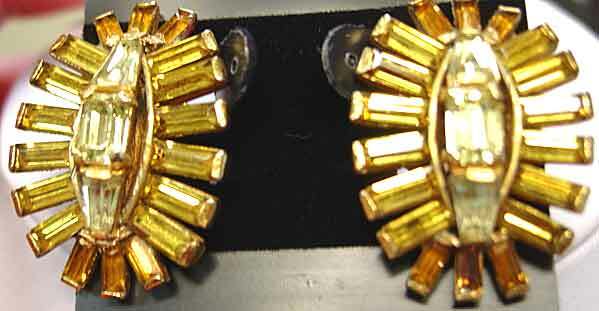 Pinwheel style clip earrings alternate goldtone and rhinestone leaves around a single center clear rhinestone. Necklace is 18", about 1 1/2" wide at the center point. Earrings are about 1" in diameter. Excellent condition. 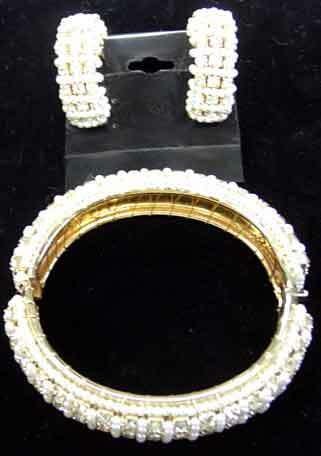 Description: Haskellesque Glass Seed Pearl and Clear Rhinestone Hinged Bangle and Earrings Set - Wow, lots of hand-wiring and components on this great Set. Hoop Earrings alternate a row of tiny white pearls with clear prongset rhinestones; 1 1/4" in diameter and about 1/2" wide. Bracelet follows the same pattern - notice the attention to detail with the row of seed pearls surrounding the entire design on all edges. Bracelet is 2 1/2" x 2 1/8" inner dimensions, and 5/8" wide, with a push-in clasp. Excellent if not pristine condition. This was someone's prized set. 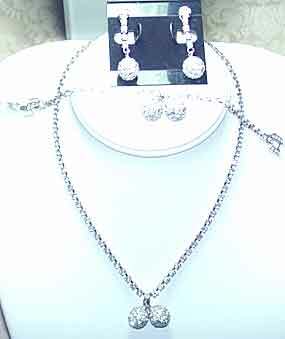 Description: Very Nice Baguette and Round Choker and Dangle Earrings Set - This necklace sports a hidden clasp and a safety chain, indicating an originally expensive set. Large baguettes alternate all around with links of two dentelles and six small chatons around the entire necklace. 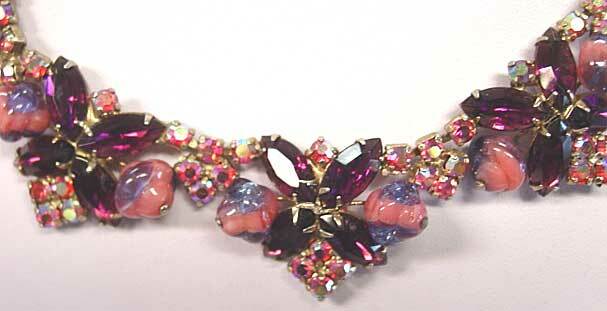 Rhinestone set push in v clasp; necklace is about 15 1/2". 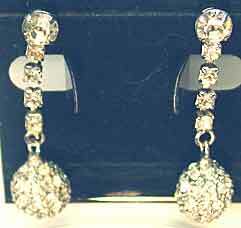 Screwback earrings use baguette and round alternating drops on rhinestone chain, 2 1/4" x 1" at widest point. 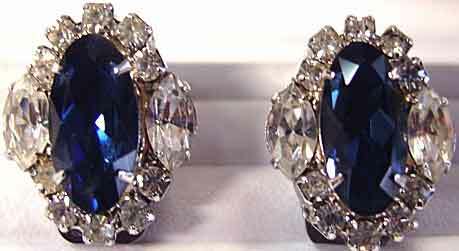 (Earrings could be converted to pierced). Silvertone setting, excellent original vintage condition; the baguettes are in amazingly good condition for a late 1940's set. 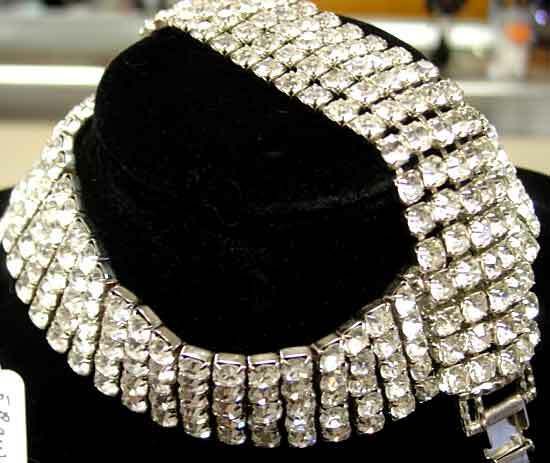 Description: Five Row Large Clear Rhinestone Dog Collar Necklace and Bracelet Set - If you are planning to do a Marilyn Monroe in "Diamonds Are a Girl's Best Friend" impersonation, here is the set for YOU. 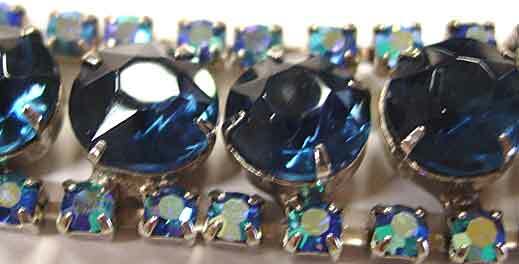 Five rows of sparkling prong-set 6mm rhinestones make up each of these pieces. The necklace is about 13" wearable length x 1 1/4" wide; bracelet is 7 3/4" x 1 1/4". Silvertone, excellent condition. Absolutely knockout pieces. 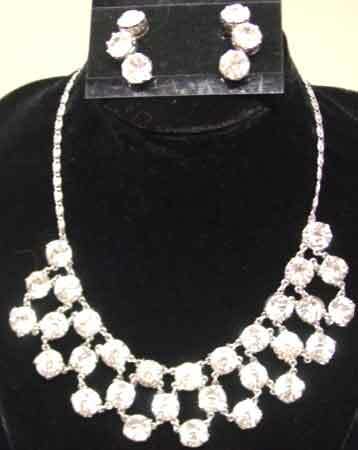 Description: Fabulous Clear Rhinestone Necklace and Earrings Set with Huge Stones - Huge as in almost 11mm. 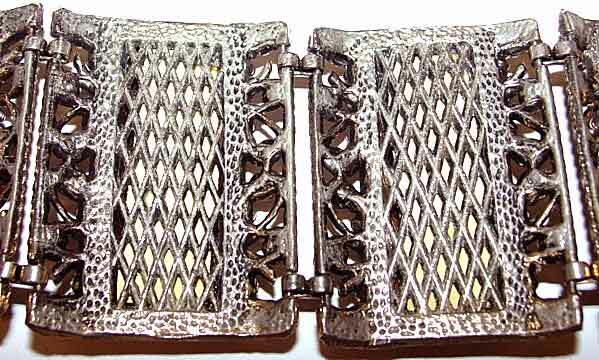 This lattice look design for the necklace measures about 6 1/2" x 1 1/4", with the remainder of the necklace being chain and an 11mm rhinestone push in clasp. Necklace measures about 15", with matching clip earrings 1 1/4" x 1/2". 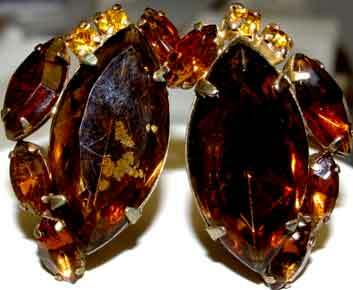 Stones are all prong set, excellent condition. 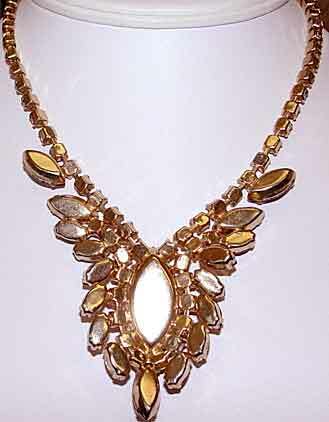 Amazing sparkle, if you are searching for a headlight type necklace look no further. 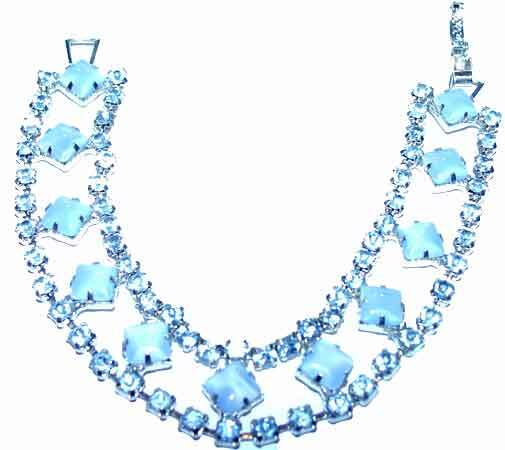 Description: Aqua and Clear Rhinestone Necklace and Bracelet Set - Large oval aqua rhinestones are surrounded by clear rhinestone borders and each link is connected with a single large clear dentelle round. 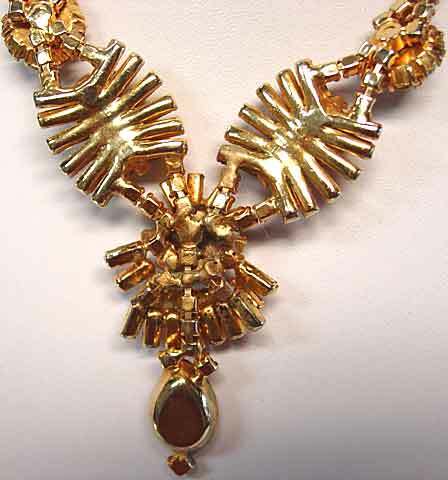 Necklace finishes with a rhinestone set link chain similar to the types Bogoff used (this does not appear to be Bogoff) and ends with a push in invisible clasp. 3/4" wide in front, back link chain is approx. 3/16". About 14" long and probably meant to be worn as a dog collar. Bracelet follows the pattern of the front of the necklace, 6 7/8", with hidden push in clasp and safety chain. Excellent condition, very nice quality. 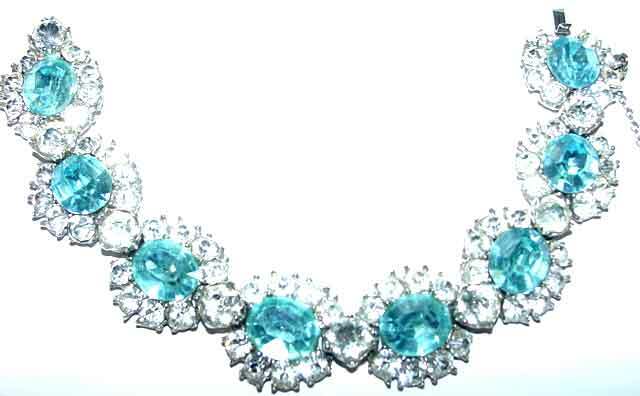 I would date this to very late 1950's. Silvertone setting. 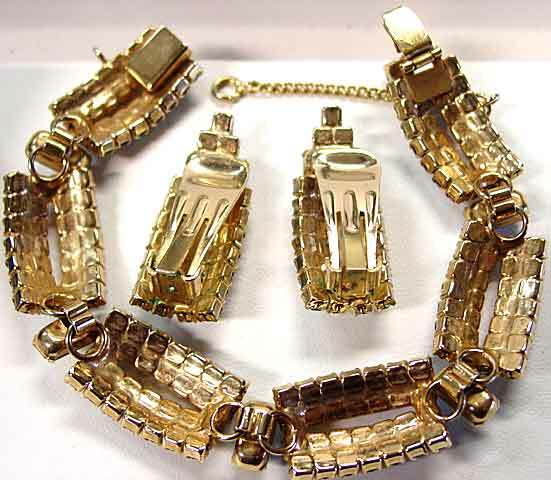 Description: Yellow Topaz Rhinestone Wide Bracelet and Earrings Set - When I first got interested in collecting 25 years ago, while these sets weren't common, you did come across them occasionally. Now, almost never. 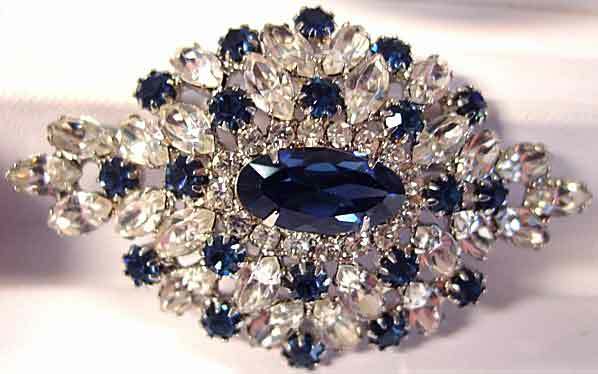 Beautiful quality stones make these incredibly sparkly pieces, you will not be disappointed when you see them in person. Bracelet is done in rows of octagonal stones alternating with rounds, push in hidden clasp, safety chain, standard 7" x 1 1/4" wide, goldtone setting. 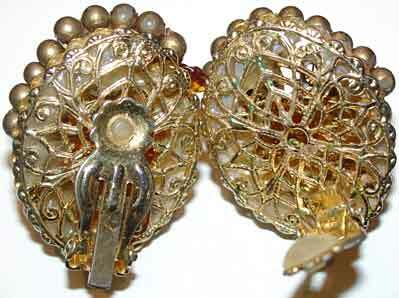 Clip earrings use the octagons as a border around a flower of round stones, 1 1/4" in diameter, slightly domed. 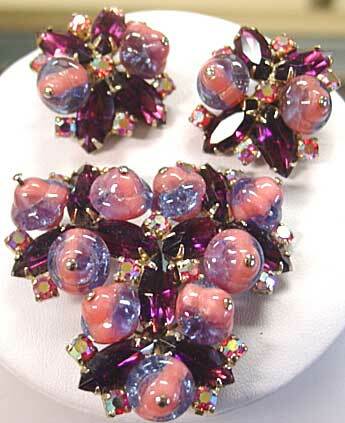 Excellent condition, a glamorous and wonderful set. 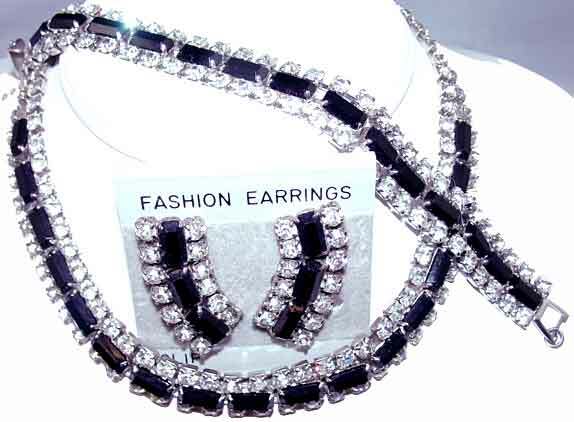 Description: Black and Clear Rhinestone Necklace, Bracelet and Earrings Set - Sometimes when you find unmarked jewelry "sets", well, they're not really sets, but marriages - similar pieces in the same color family, maybe even the same brand, but not true sets. 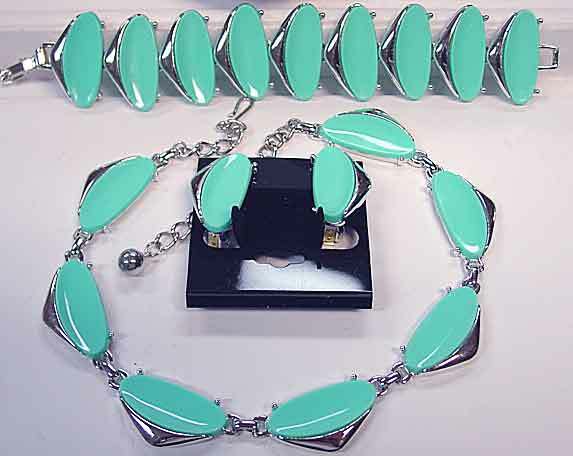 This is a matching SET, of a choker necklace, link bracelet and clip earrings. 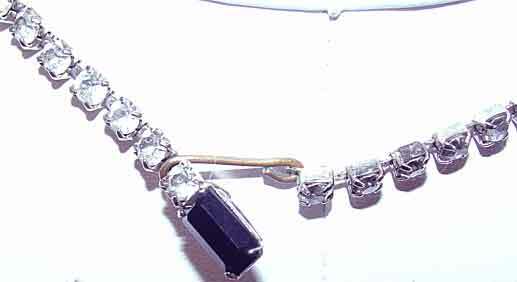 Done in all black baguettes and clear round rhinestones, all prong set. Necklace is a dog collar style, adjustable to 14 1/2", and 1/2" in wide at front. Bracelet is almost 7" x 1/2", and it appears that a previous owner decided to add a safety chain, which works well but is not original and could be easily removed if desired. Earrings are 1 5/16" x 1/2". 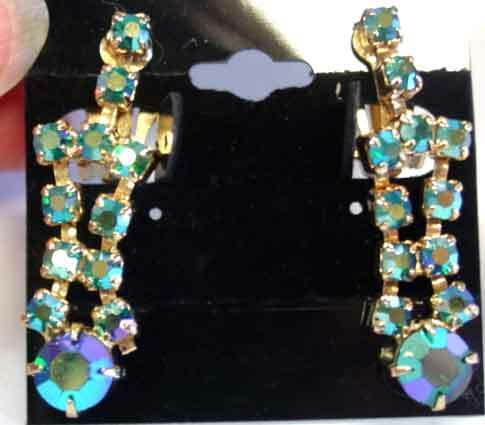 Excellent condition, this set looks as if it had been saved for special occasions, as plating looks virtually unworn. Hook on necklace may be a replacement as it appears to be brass rather than silvertone (I can replace with a silvertone one if desired) but I have left as is because a thin hook is required to get in between the rhinestones to catch properly, and this one works fine while others may not. Great price. 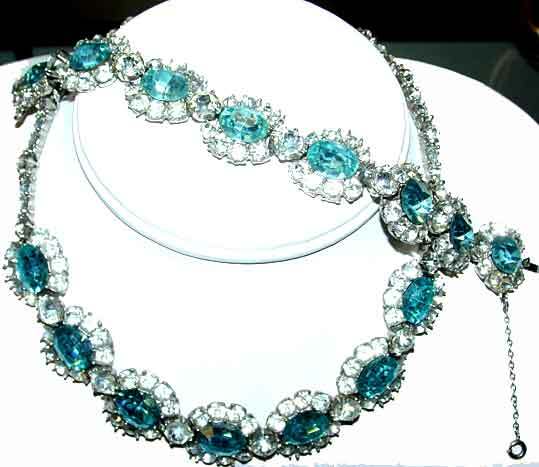 Description: Gorgeous Aqua Bead/Clear Rhinestone Demi Parure - Very nice necklace/earrings/bracelet set uses turquoise colored glass beads and clear rhinestones set in silvertone. 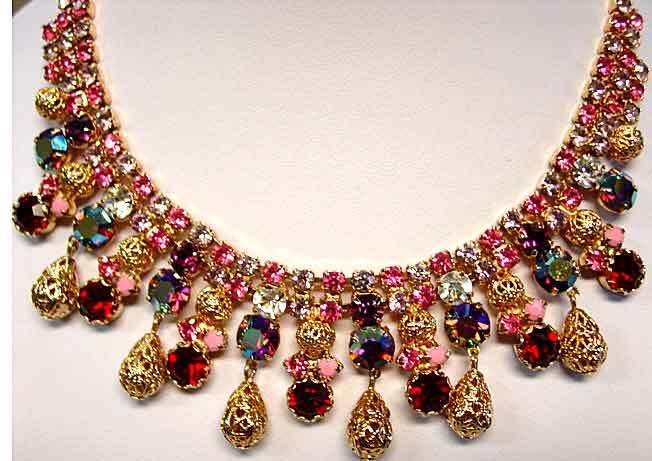 Dog-collar style necklace is adjustable with a hook and tail closure, up to 15", about 1" wide, with 7 sets of 3 rhinestones spaced evenly across the front. 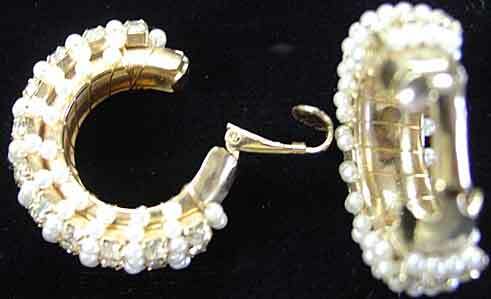 Clip earrings are about 7/8" in diameter and use clear rhinestones around the perimeter to separate the beads, and channel set baguettes up the bottom center. 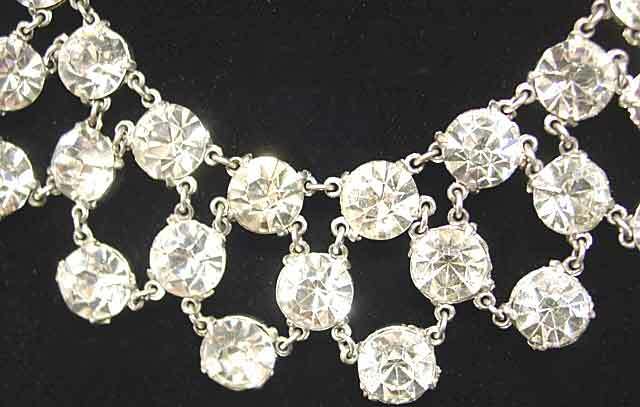 Last but not least is the bracelet with an incredible deco inspired clear rhinestone clasp and terminals, with the same clear rhinestone spacers found in the necklace spaced evenly around the entire bracelet. Bracelet is 7 1/2" x 1". Outside of a little darkening to the baguettes on the earrings I find this demi to be in excellent condition. If a "Moghul" look is what you are seeking, this is a lovely set. 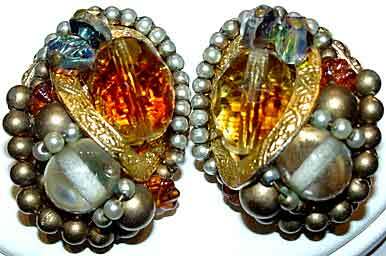 Description: Atomic Brooch & Earring Set Autumn Colors - Done in olive green, emerald green, golden topaz, light Colorado topaz, and hyacinth rhinetones, this set is indeed a "blast" from the past. 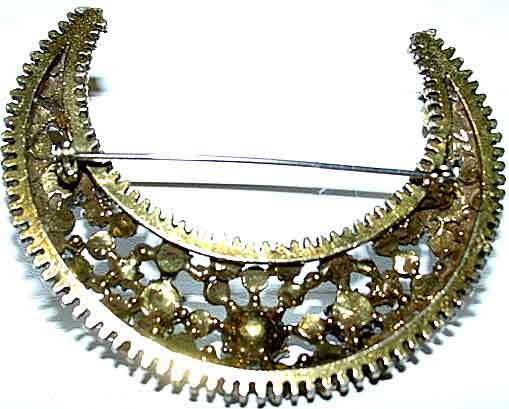 All rhinestones are paste set into riveted settings, harp type clasp on the brooch, earrings are clip. 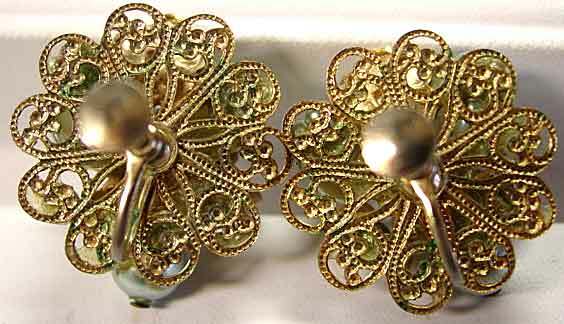 All are set in goldtone, excellent original condition. Late 1950's-early 1960's. Domed brooch is 2" in diameter and almost 1/2" deep. 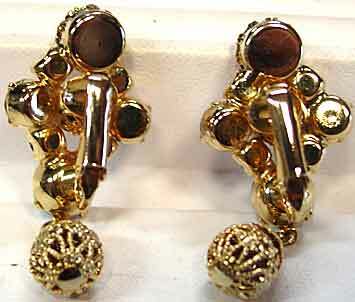 Earrings are also domed, about 1" in diameter. While these are traditional fall colors you could probably find something in your wardrobe that this would go with all year 'round. 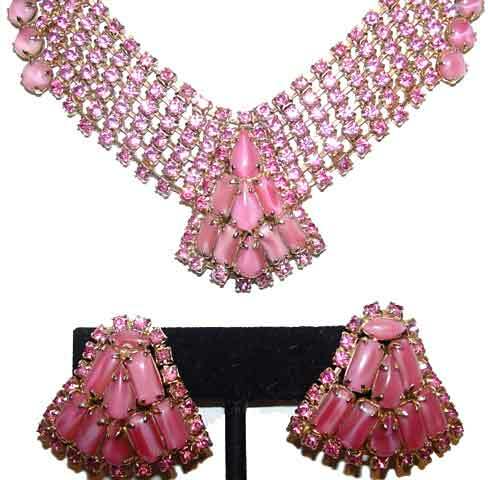 Description: Gorgeous Pink Faux Moonstone Necklace and Earring Set - Many of these sets are "marriages"; this one is, obviously, a match. 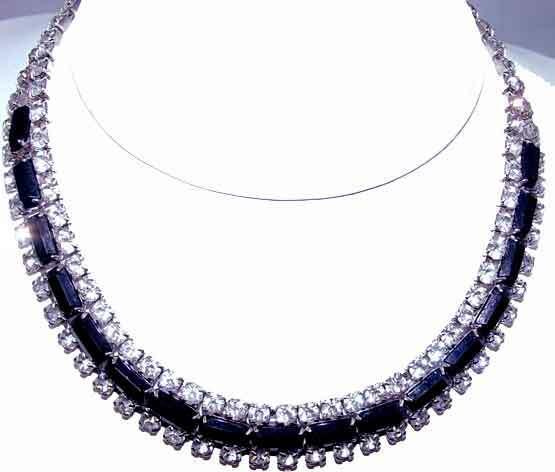 Necklace has a rounded triangular motif of teardrops in the center and baguettes on either side, surrounded by rhinestones chain. More chain, 5 rows, make up the central portion of the necklace and terminate on either side with glass moonstone rounds. 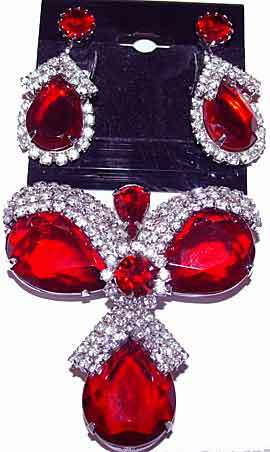 The sixth row of rhinestones forms the chain, which is 15 1/2", adjustable hook clasp, tail ends with another round moonstone. 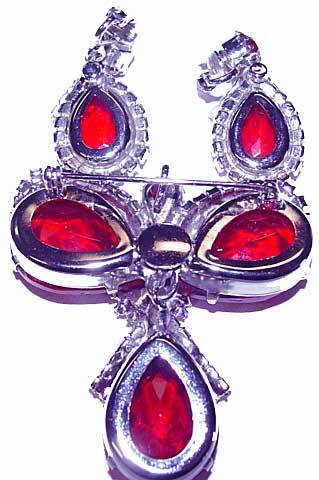 Earrings repeat the necklace center motif except that the is a horizontally set marquise rather than a teardrop. 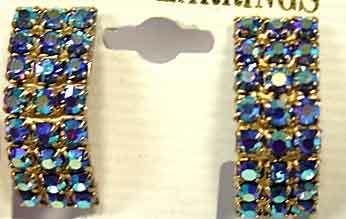 Earrings are clip, 1 1/4" x 1 1/4", goldtone setting for both pieces. 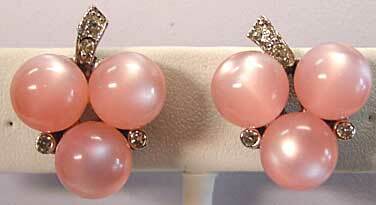 Other than one tiny ding in one of the earrings marquises this set is in perfect condition. 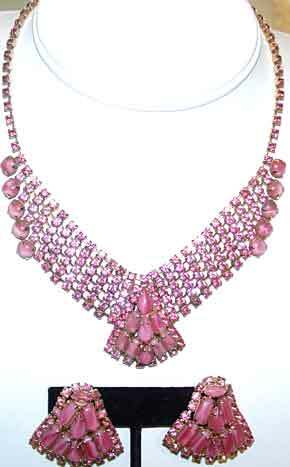 Description: Pink Glass Moonstone/Pink Rhinestone Necklace and Earring Set - Really super set! 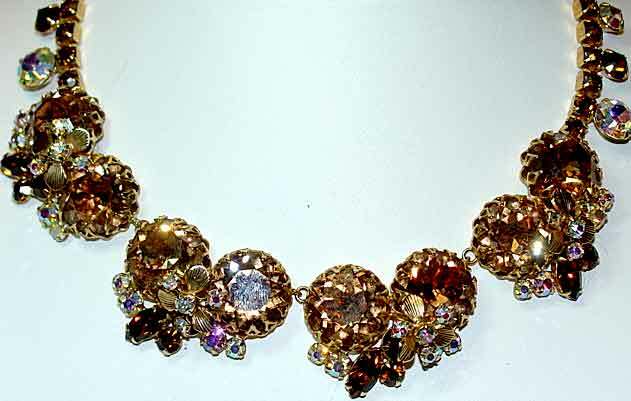 The bracelet uses rectangular (octagon) stones in two rows that alternate with rows of pink rhinestone chain. Goldtone setting. 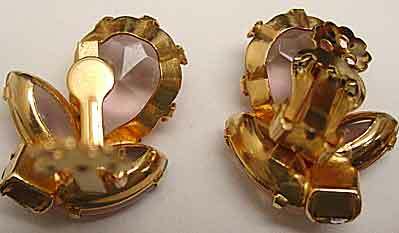 Clip earrings use the same rectangular stone, surrounds it with baguettes and then borders it with round moonstones alternating with sets of three pink rhinestones. 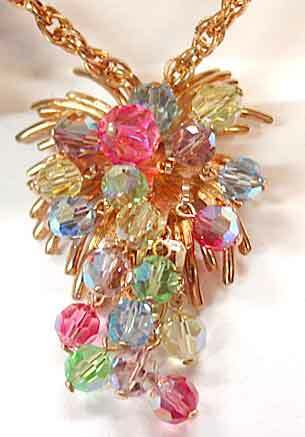 Bracelet has a foldover clasp, 7 1/4" wearable length x 1" wide. Earrings are 7/8" x 7/8". Excellent condition, anything that looks like plating wear in the photo is either shadows, reflections or marks caused by some goo from a long gone sticker that I removed with Goo Gone after I looked at the picture! 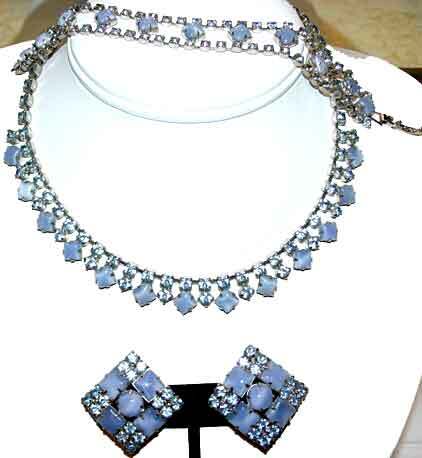 Description: Blue Faux Moonstone and Rhinestone Necklace, Bracelet and Earring Demi - Very pretty set using square shaped medium blue glass moonstones and light sapphire rhinestones. 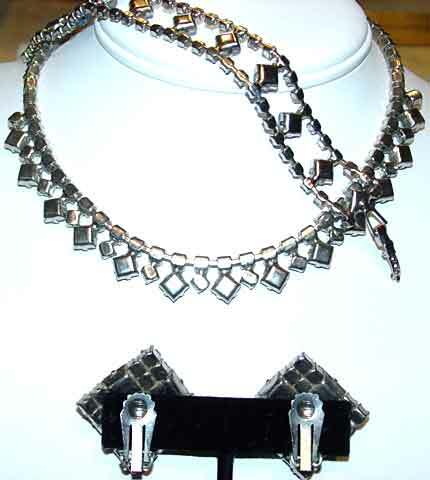 Necklace is a modified fringe style having rhinestone chain with the square moonstones alternating with more rhinestones to provide the "fringe". 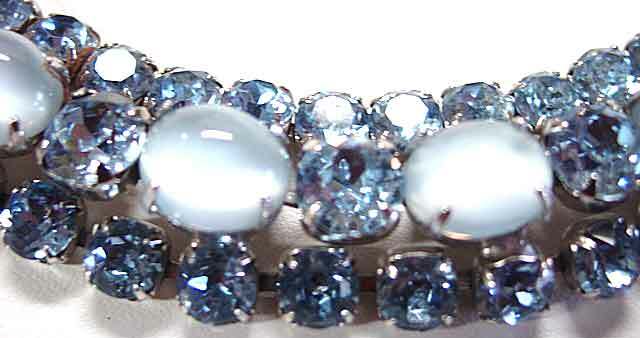 Bracelet has two rows of rhinestone chain centered with a spaced row of square moonstones. Earrings used slightly larger squares around a center round moonstone cab; the squares alternate with groups of four rhinestones. Necklace has a foldover clasp and measures 15"; bracelet is just shy of 7" wearable length with identical foldover clasp. 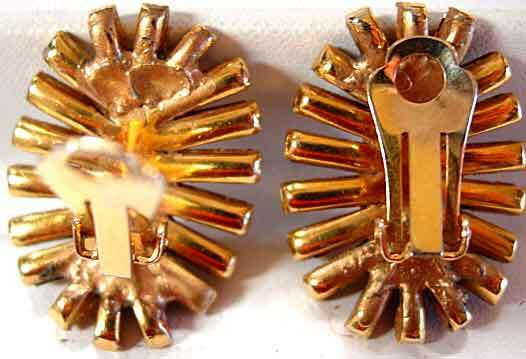 Clip earrings are 1" x 1" and are probably a marriage, but the entire set was given to my mother in the early 1960's so if there were different earrings sold with this set they must not have been available. Excellent condition, worn maybe once or twice. 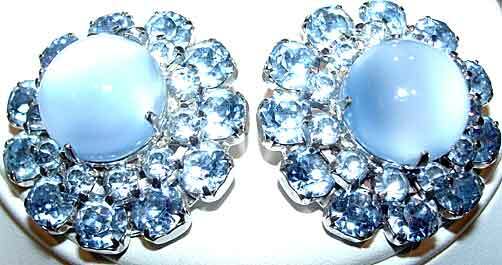 Description: Light Blue Glass Moonstone/Lt. 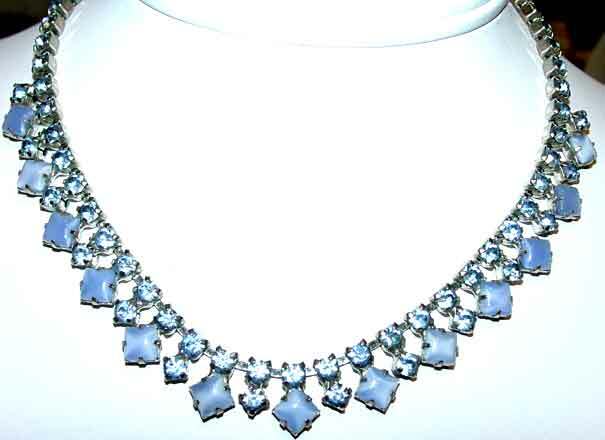 Sapphire Rhinestone Necklace and Earring Set - Pretty riviere style choker necklace alternates large 11mm moonstone cabochons and dentelle (fancy) cut rhinestones most of the way around, with light blue rhinestone chain extensions. Clip earrings are layered with center moonstone surrounded by a row of rhinestone chain and a second layer of larger dentelle cut rhinestones around the border. 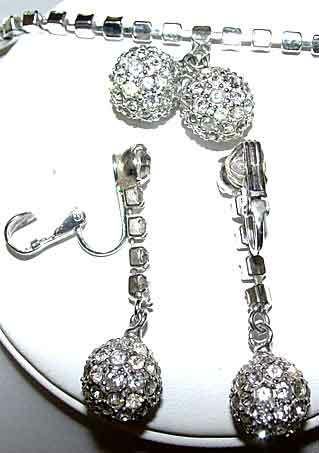 Silvertone settings, clip earrings and adjustable tail/hook necklace. 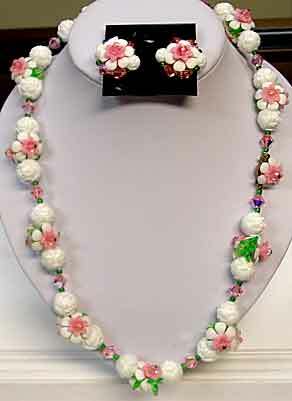 Necklace extends to 15 1/2", earrings are 1 1/8" in diameter. 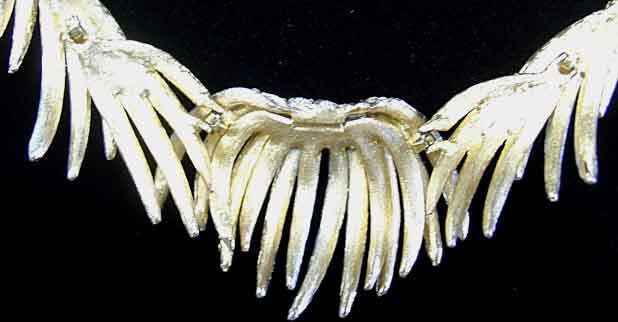 Necklace plating shows some pitting on the back where it would contact with skin, otherwise excellent condition. 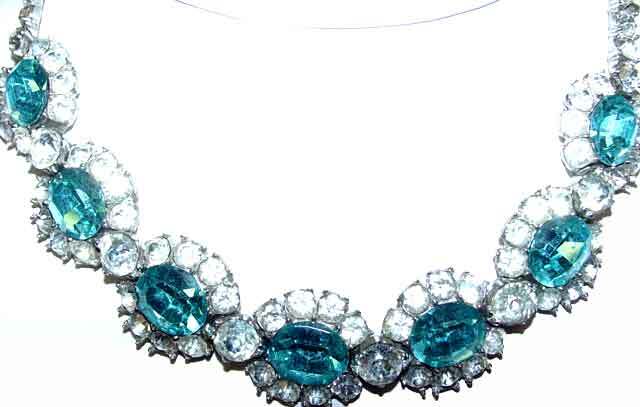 Large blue rhinestones in necklace are particularly beautiful; this reminds me of Fenichel. 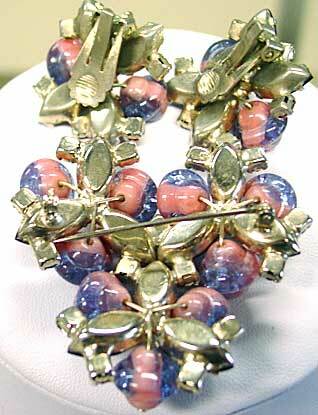 Description: Autumn Watermelon Stone Bolo Style Necklace and Earring Set - This is a stone color that I am unsure of. 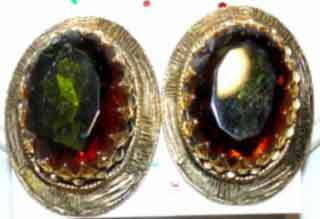 Just as watermelon stones are olive green/fuchsia, this is olive green in the center with topaz-orange-brown around the outside. Whatever it is properly called, it is lovely with autumn toned clothing. 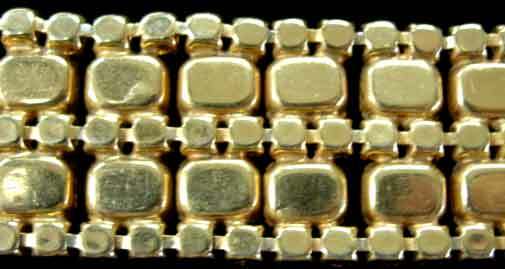 All stones are in a dog-toothed setting, surrounded by a rope-turned trim and then a larger border of "striped" goldtone metal. 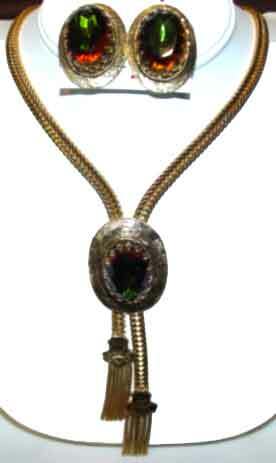 Bolo necklace measures about 32" and needs to be at almost full extension to fit comfortably around the neck. 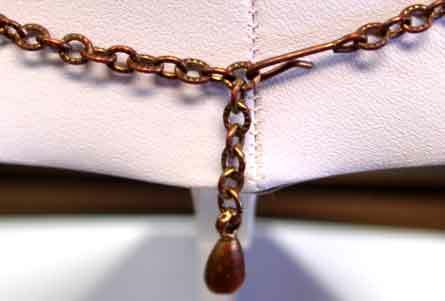 Herringbone type chain is 1/4" wide, and ends with a fancy tip from which dangle several foxtail chains. Earrings are clip, 1 3/8" x 1" x 1/2" deep. The adjustable strands were loose when we got this and the back had to be re-corked/cold soldered so that it would slide but still hold in place when adjusted. Otherwise excellent condition, stones are really nice and plating is great. 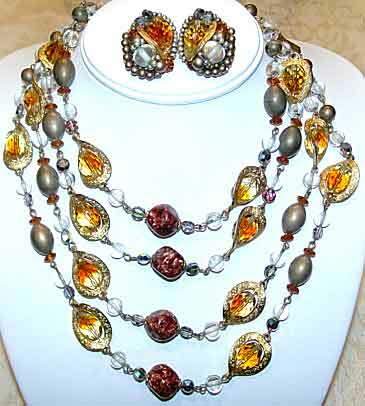 Description: Spectacular 4 strand Necklace and Earrings Set - This uses some truly unusual beads in unusual ways. 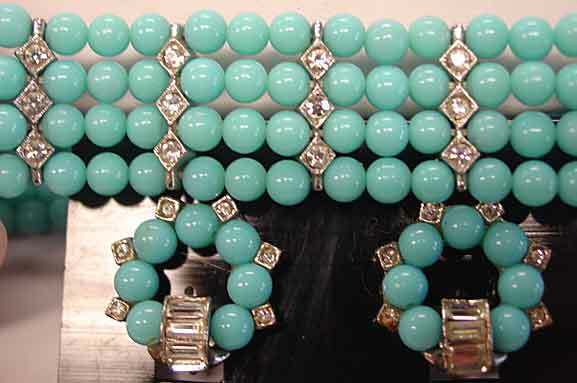 Clear faceted oval beads are "shot" with topaz color and bordered with embossed metal "collars". 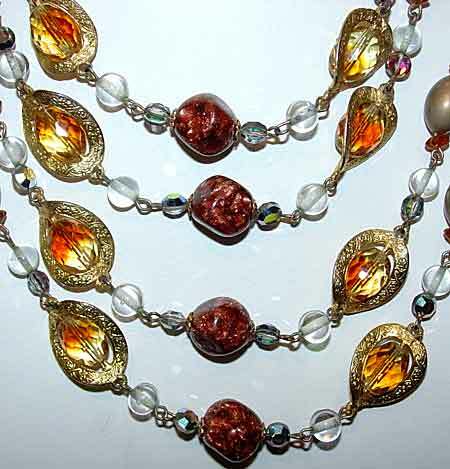 Add in coppery gold "fluss" beads going down the center and use watermelon AB flattened bicones, as well as clear unfaceted balls, matte taupe colored oval beads and scalloped edged topaz colored bicones, and you have a cacophony of fall colors deluxe! Clip earrings also use small grey seed pearls and slightly larger taupe beads, handwired into the design which uses a double filigree backing. I do NOT think this is Haskell but probably European. Whatever this is, it definitely stops traffic! Earrings are about 1 1/4" x 7/8"; necklace graduates from 11" to 15" plus extensions for hook and bead chain clasp of 5 1/2", so that this will accomodate up to a 16 1/2" neck. Excellent condition. 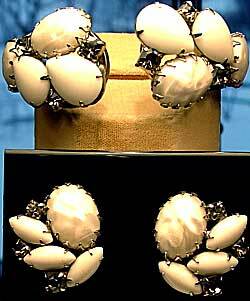 Description: Possible D&E Chalk White Brooch and Earring Set - Brooch has open and closed backs, built in pin stem. 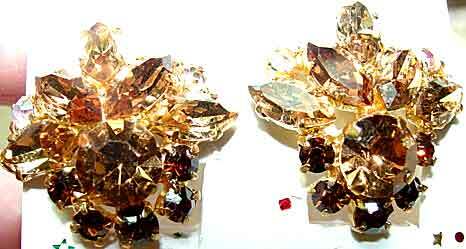 Older style triangular earring backs, all stones are prong set. 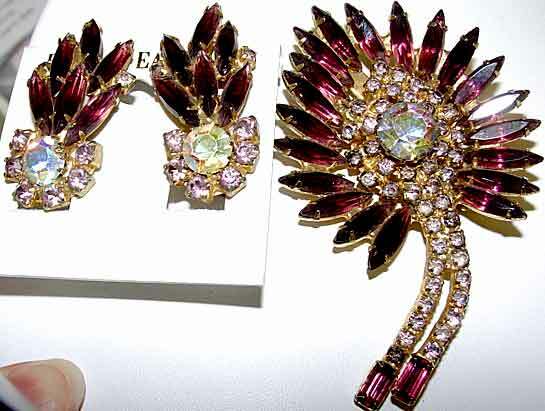 Interesting use of diamond shaped stones in both the earrings and brooch. 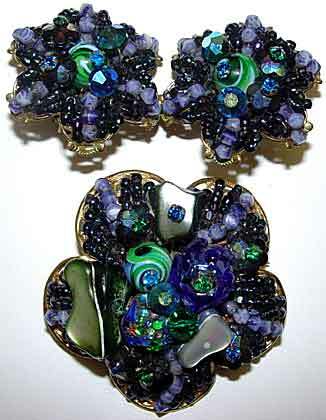 Earrings are 1 3/4" x 3/4", brooch is 2 1/2" x 1 5/8". Excellent condition. 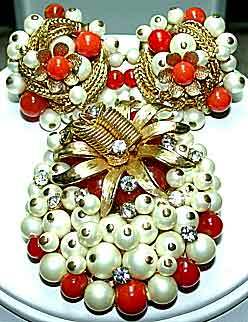 Description: Glass Pearl and Faux Carnelian Bead Pin/Pendant and Earring Set - This rust color is good for fall and this year is no exception. 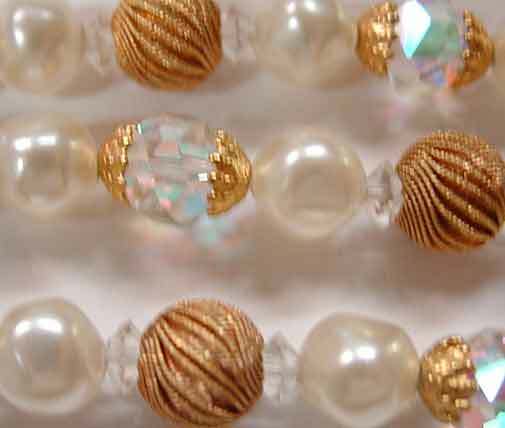 Very good quality cream colored glass pearls are either attached with headpins or wired on; earrings use crimp-bead spacers on wired sections. 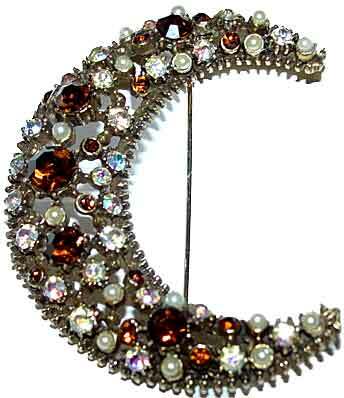 Brooch has rhinestone set headpins scattered throughout. 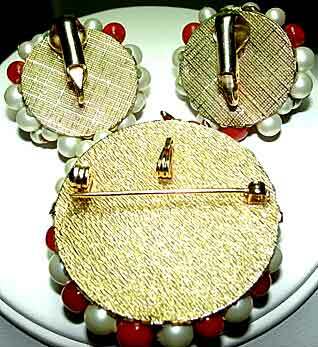 Quality pieces, excellent condition, clip earrings are 1" in diameter and brooch/pendant is 1 3/4" in diameter. The number and quality of components in this piece justifies the cost without even factoring in the labor. 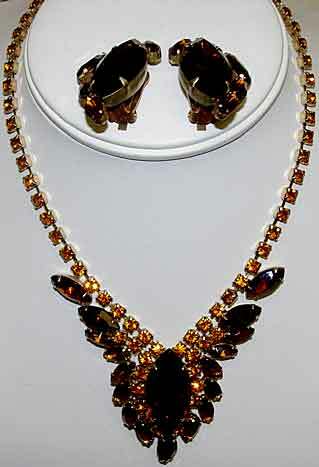 Description: Light Colorado Topaz, Smokey Topaz and Aurora Borealis Rhinestone Necklace and Earring "Set" - Actually this is probably not a set, but a great marriage; it was sold to me as a set and other than the exact match I think you would be hard put to find a better match so I am including them. 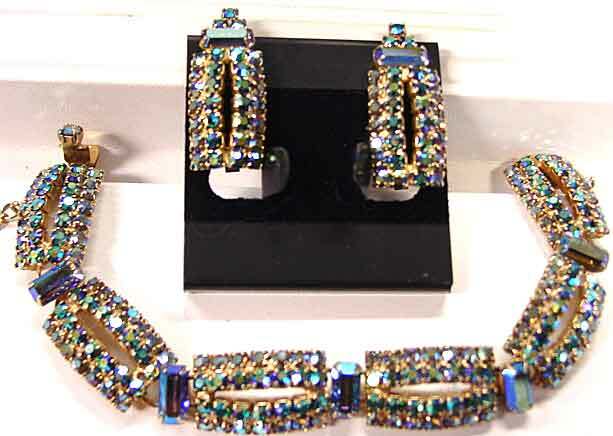 Huge 14mm dentelles in light Colorado topaz are dogtooth set in pairs on either side of an aurora borealis set goldtone flower, and accented with smokey topaz rhinestone marquises and rounds. 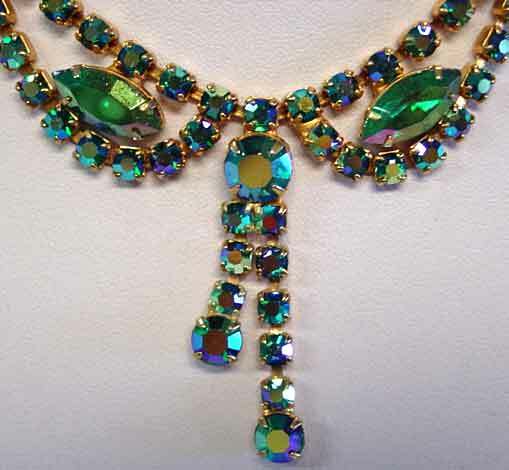 Chain is done in dark brown rhinestones with graduated aurora borealis and smoked topaz rhinestone accents. 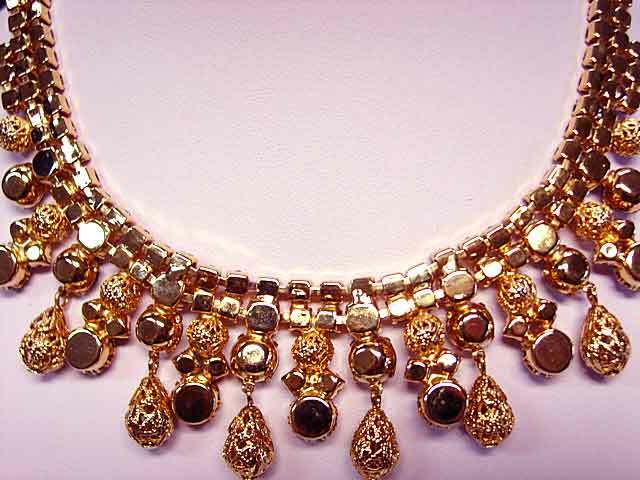 All pronged set; 14mm stones are in "piecrust" settings and this is probably an unsigned Schreiner piece; necklace is adjustable to 16", with a hook and chain closure, chain has three prong set brown rhinestones dangling as a decoration. 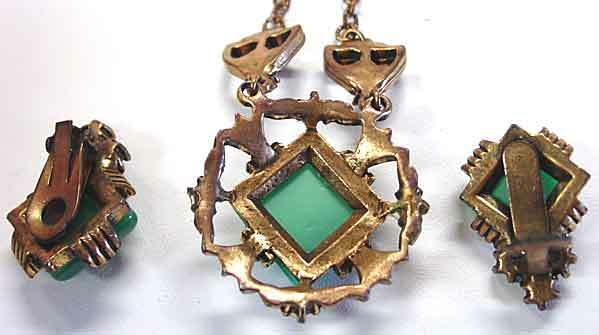 Earrings are marked "Made Austria" with rounds and marquises in the same three colors of stones as the necklace, clip findings, 1" in diameter. 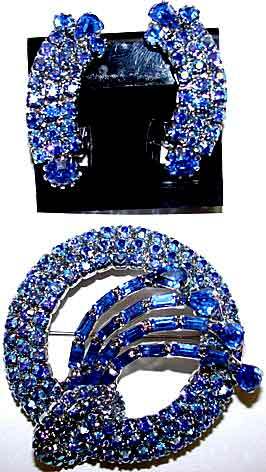 Description: Top Quality Sapphire Blue/Blue Aurora Borealis Rhinestone Brooch and Earring Set - Whoever made this set should have signed it because it is outstanding. All prong set stones in a super nice 3 dimensional design - bottom "loop" of stone goes around the circular brooch and "vines" come from behind and go out over the top. 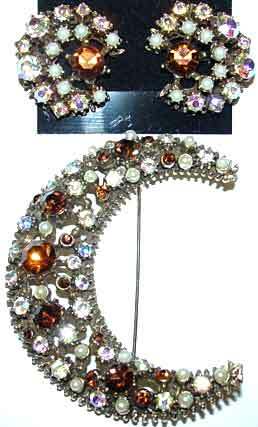 Clip earrings are curved and slightly domed. Brooch is about 1 7/8" in diameter and earrings are 1 1/4" x 7/16". Incredibly sparkly and substantial feeling. 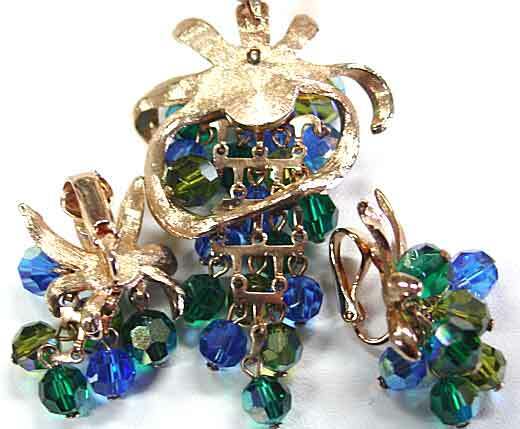 Description: Blue and Green Haskellesque Hand-Wired Brooch and Earring Set - While I don't think this is Haskell it was done by someone trying to copy the Haskell style. All handwired using lapis/soldalite look faceted beads, dark blue aurora borealis seed beads, wonderful blue/green swirled glass beads secured with capri blue headpins, flattened green AB crystal rounds, lumpy multi colored art glass, deep peacock art beads and blue ab flower beads attached with green head pins AND what almost looks like tumbled abalone shell. Whew! Amazing little pieces of work, these would be a bundle if they were Haskell. Excellent condition. 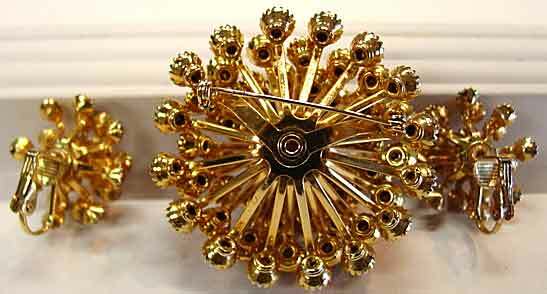 Brooch is a curved pentagonal, 1 3/4" in diameter, clip earrings are 1 1/8" in diameter. 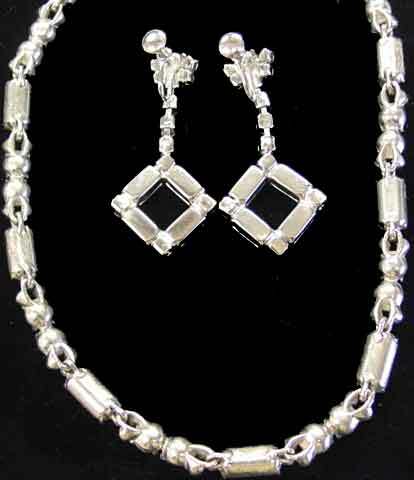 Description: Unsigned Milk Glass/Pearlized Glass/Black Diamond Clamper Bracelet and Earrings Set - A lovely combination of black diamond rhinestones and pearlized white oval cabochons with chalk white glass marquises. Pearlized cabs are slightly lumpy, making a nice contrast to the plain marquises. 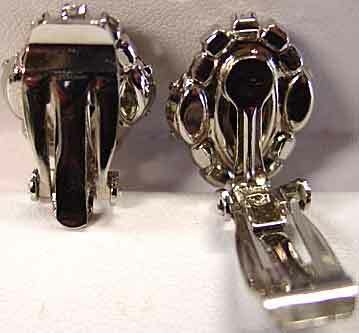 Dogtooth setting for the oval cabochons, hinged clamper bracelet is silvertone and closes nicely (opened for display only) and 1 1/8" x 1" earrings are clip. Almost certainly unsigned Regency. 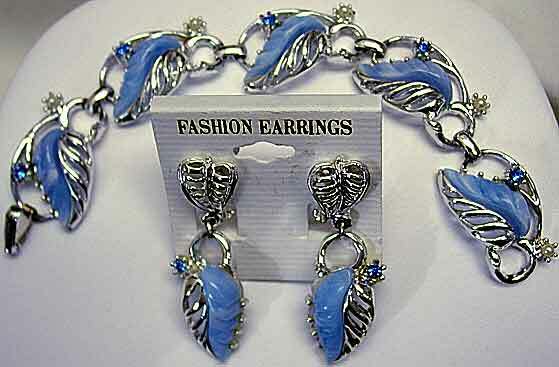 Description: Blue Marbled Molded Thermoplastic Leaf Bracelet and Earring Set - Pretty blue and white marbled leaves are accented with dark blue rhinestones and white glass pearls. Silvertone. 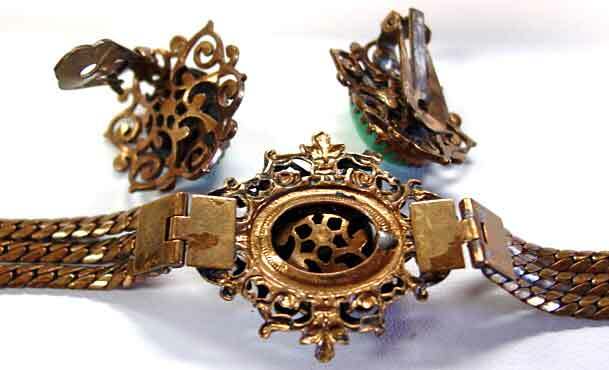 Bracelet has foldover clasp and measures about 7 1/4" including clasp; screwback earrings dangle 2". Thanks to Susanne Klein's book on Mid-Century Plastics there is rising interest in this genre. 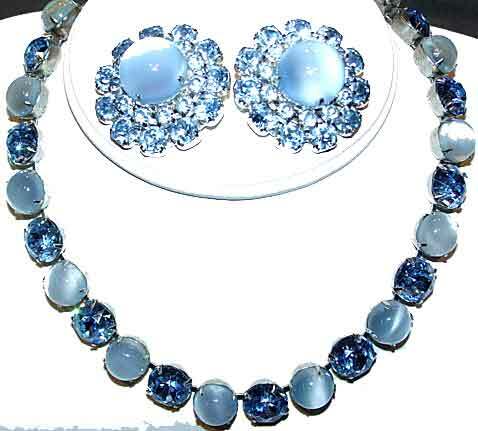 Description: Clear Rhinestone "Tiffany Ball" Necklace, Bracelet and Earring set - Very nice demi set using "Tiffany" balls - similar to a rhinestone ball but completely pave set, and relatively heavy. As far as I can tell, only used by high end companies as this was a much more expensive component than a rhinestone ball. 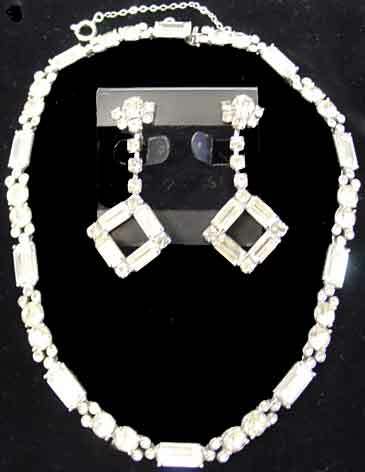 The necklace and bracelet also feature beautiful deco style foldover clasps, completely rhinestone set. 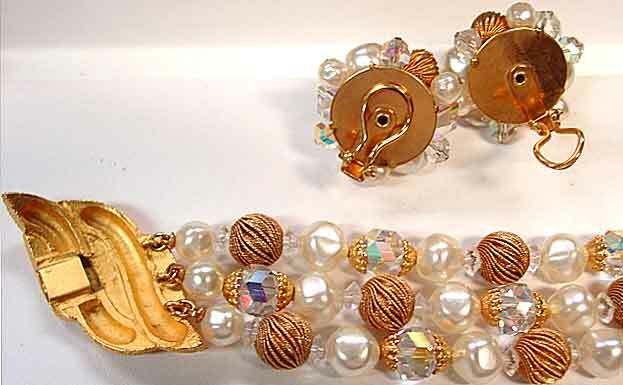 Bracelet is 6 3/4", earrings are clip, 1 3/4", necklace about 15 3/4". 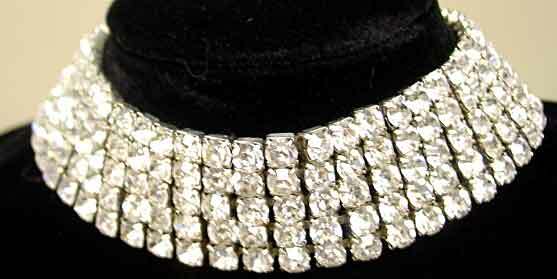 Excellent condition, with a few missing rhinestones on the balls replaced and undetectable. Description: DeLizza and Elster? 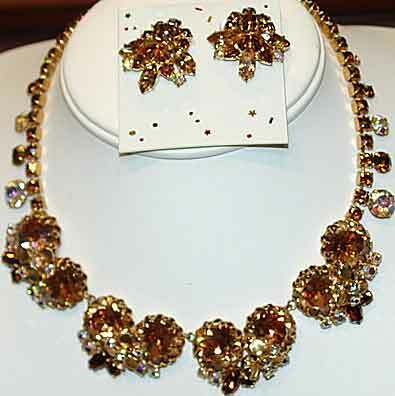 Juliana Necklace and Earring Set in Smoky and Madeira Topaz - I have not had this set confirmed but it certainly looks like a definite possibility. 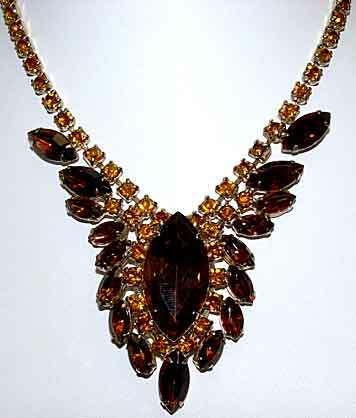 Huge marquises in smoky topaz are surrounded by smaller marquises and Madeira rhinestone chain. 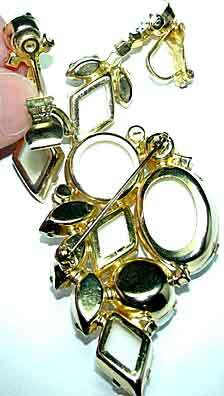 Clip earrings are 1 3/8" x 7/8"; adjustable necklace adjusts to 14". One earring is showing some foiling problems on the large stone but the flash on my camera makes it look MUCH worse than it is in person; in person you would not even notice it. A wonderful set for fall. Description: DeLizza and Elster? Clamper and Earrings Set - Unusual jelly marquise cabochons in shades of lavender are accented with lavender rhinestones and dog-tooth set unfoiled lavender pendaloque teardrop glass stones. Goldtone. All stones prong set, larger stones are all unfoiled and openbacked. 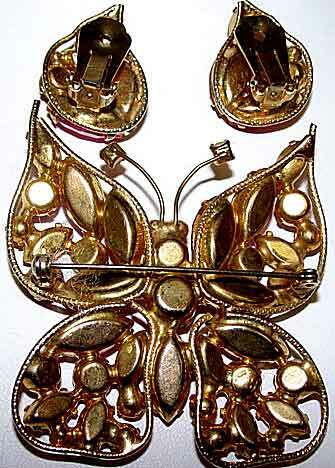 Correct clip backs, squared wire and symmetrical design. Excellent original condition, no flaws that I can see.